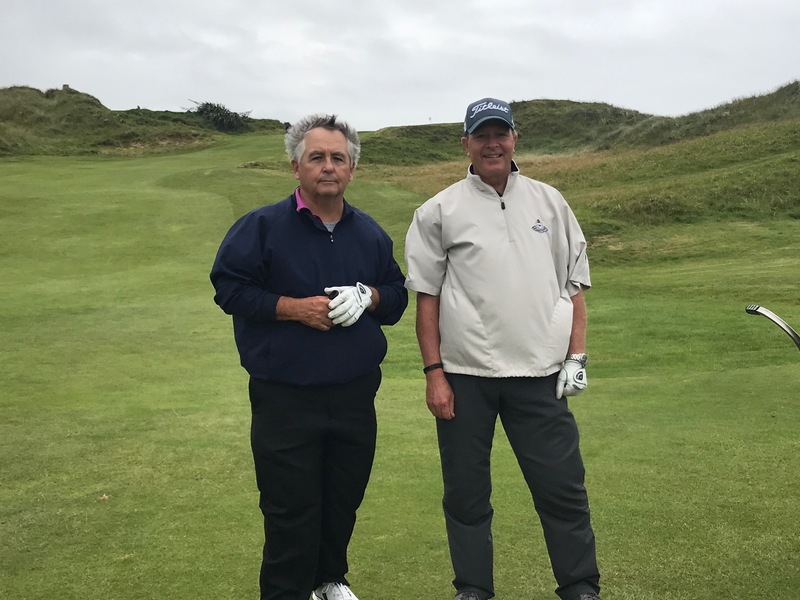 For my last day in Ireland, Paul, Bob and I played Spanish Point Golf Club, a little nine-hole course on the Atlantic coast in County Clare. 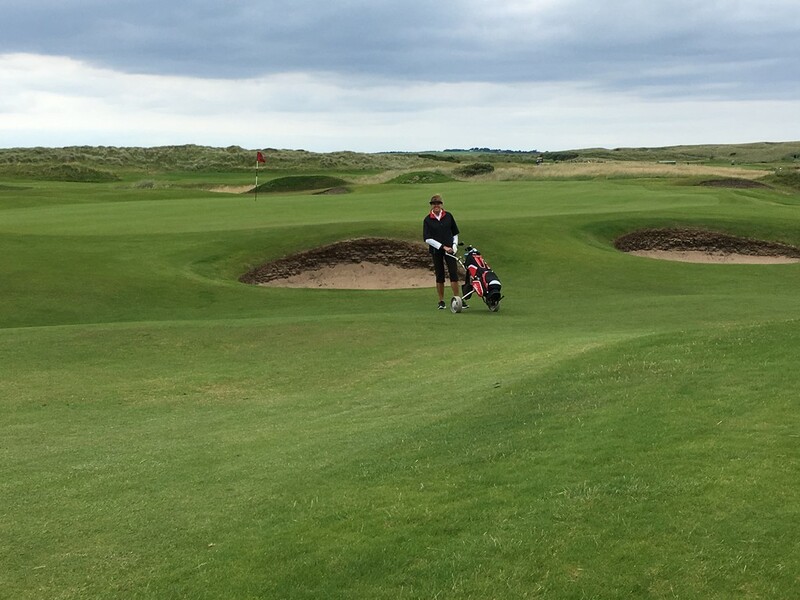 It is quite informal- pay your green fee and play the nine holes as many times as you like. We played twice. 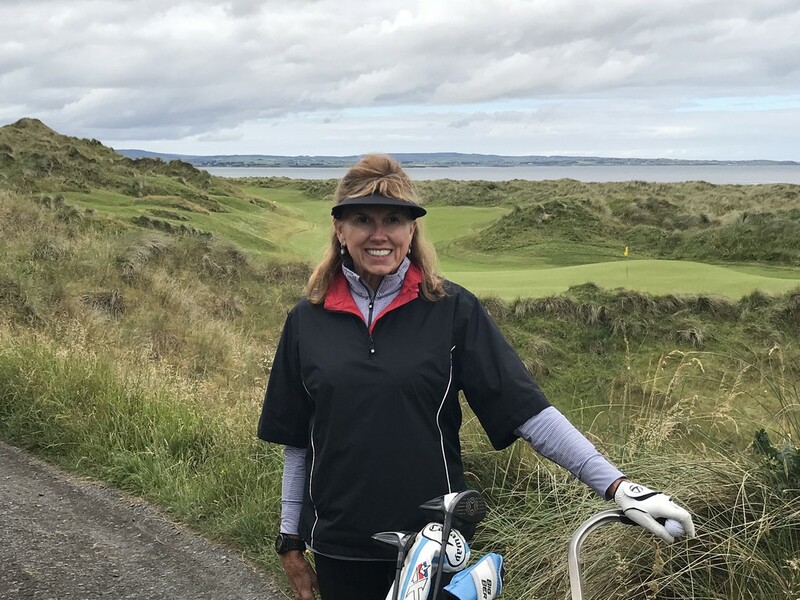 Although we couldn’t always see the green for our hole, we could see lots of other golfers on this cozy little course, and by the second time around we recognized a number of other groups. 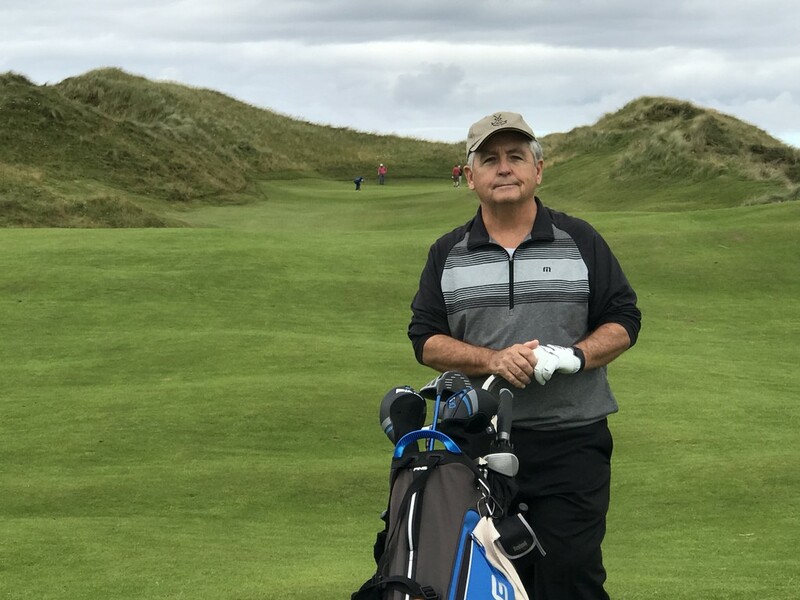 It was a hilly course, fun to walk, and just like all the other Irish courses I have played-had lots of rough to hide your errant shots. 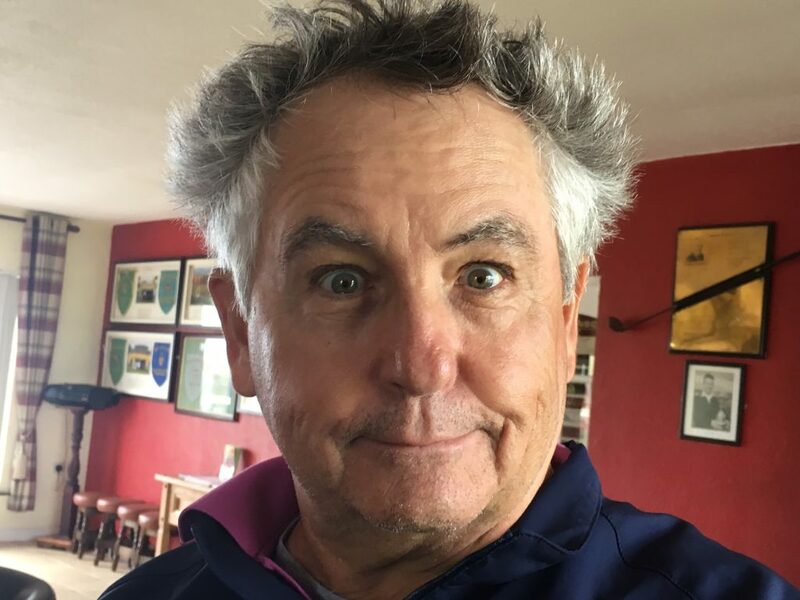 It was the windiest round of golf I have ever played, with gusts reaching forty mph-so windy that Paul was sporting a new “do” by the end of our round. 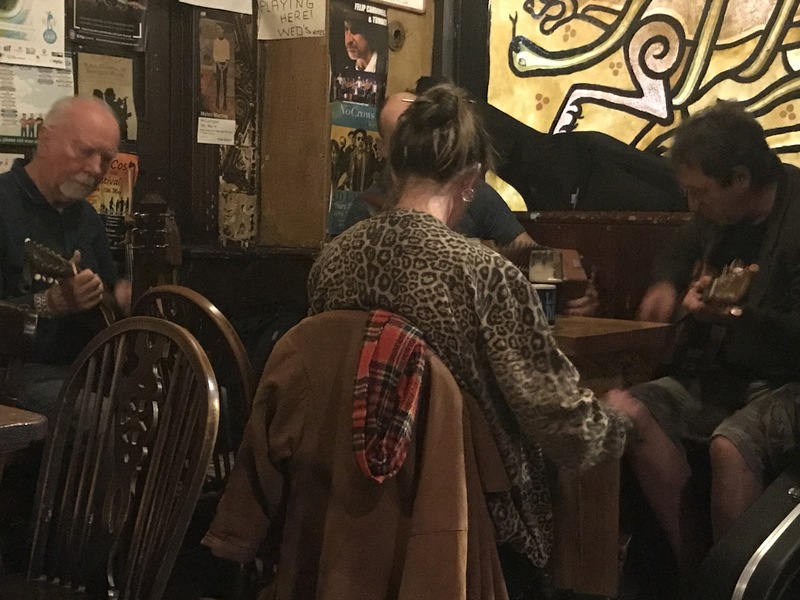 We ended the day in typical Irish fashion with a pint and trad music. 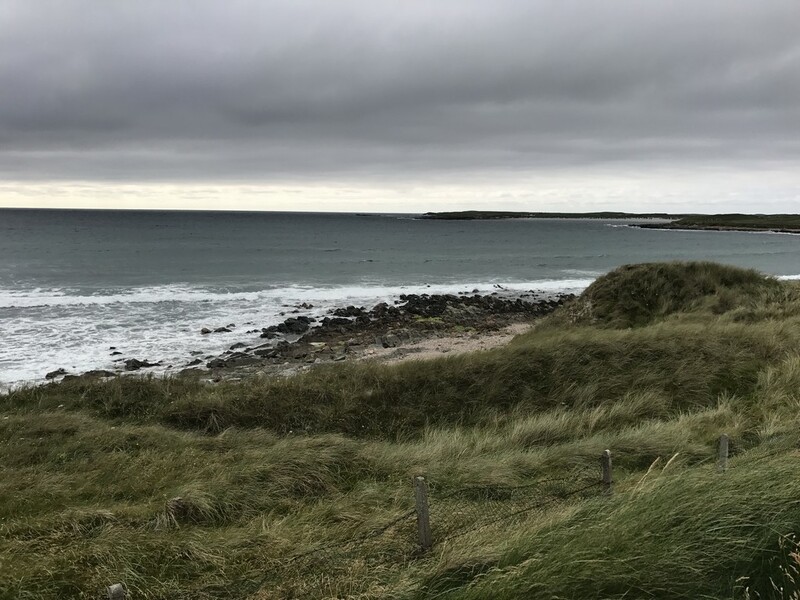 Three trips to Ireland now, and I find this enchanting country more magical each time I visit. 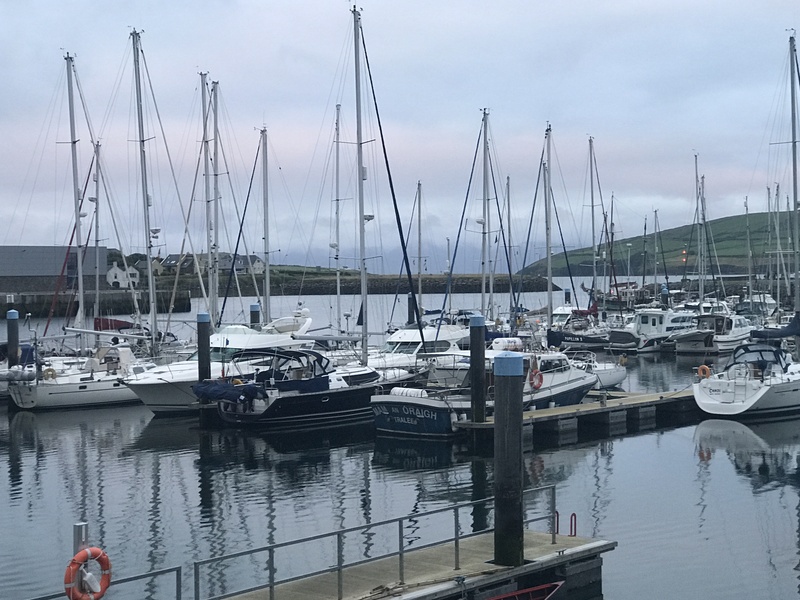 Wild Atlantic Way, a new web site and app that charts a route and highlights along nine coastal counties, was a great resource. I loved seeing the road signs that alerted us that we were on the Wild Atlantic Way; I knew it would be beautiful. Dear, Ireland, I will return. 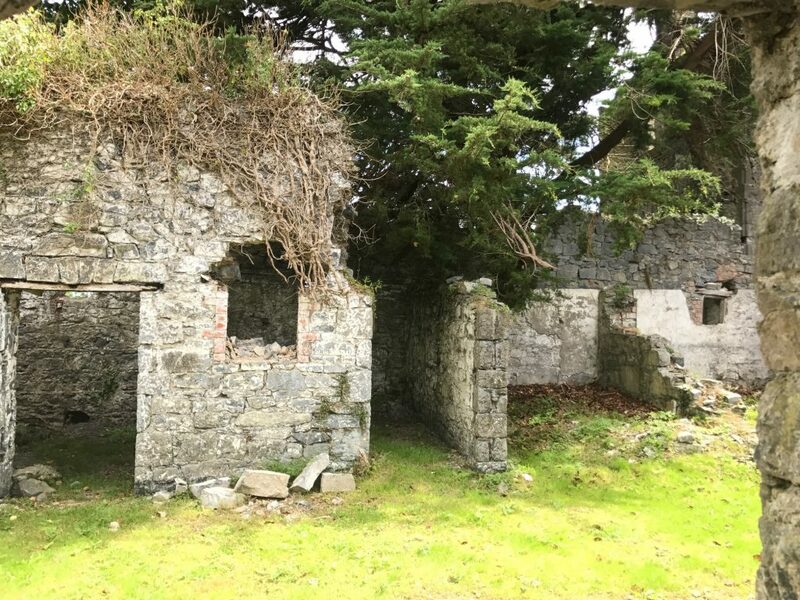 This entry was posted in Ireland 2017 on July 15, 2017 by debbie. 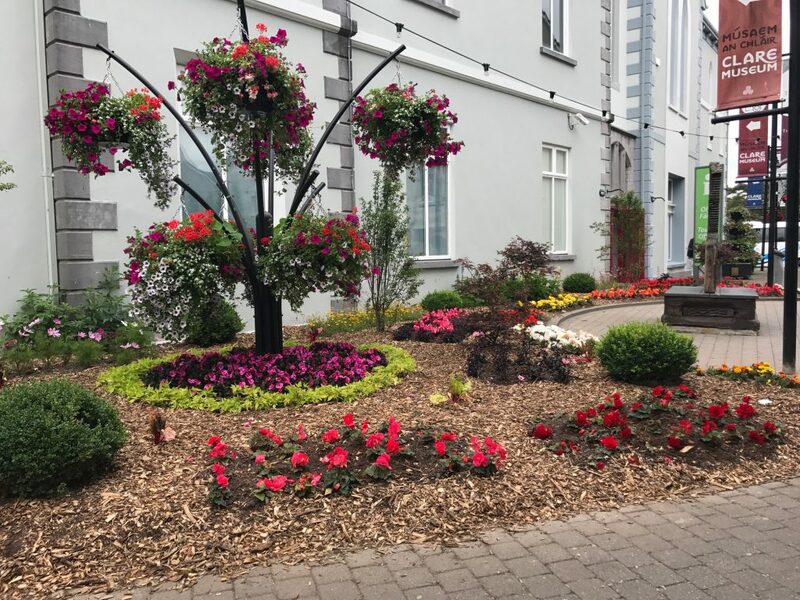 Paul picked up our friend Bob at the airport today, and they golfed at Ballybunion, so I got a solo day in delightful Ennis. Everything I wanted to see and do was walking distance from our B&B. First stop-the Clare Museum, a wonderful little museum that documents the history of County Clare from the earliest days to the present. I explored the little streets in the town center. 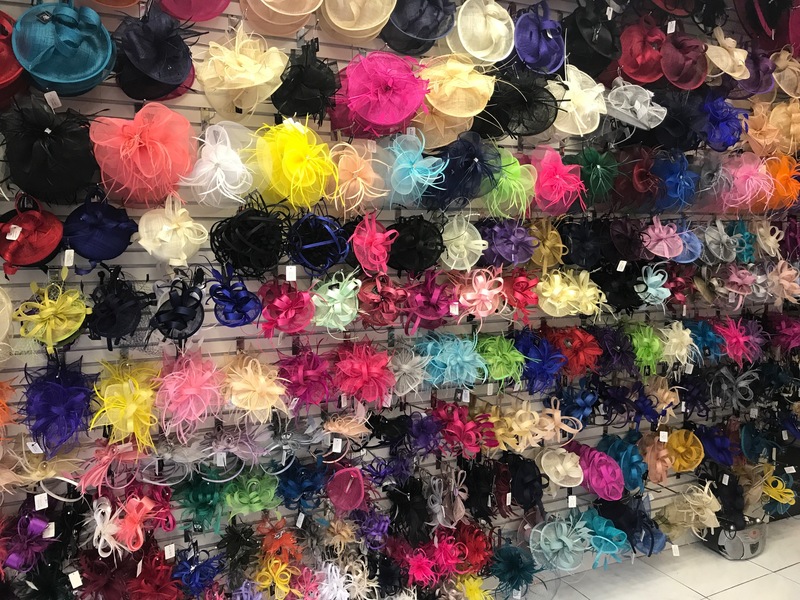 One shop had a wall of fascinators, the little headpieces often seen in the United Kingdom. I found two shops I had read about. 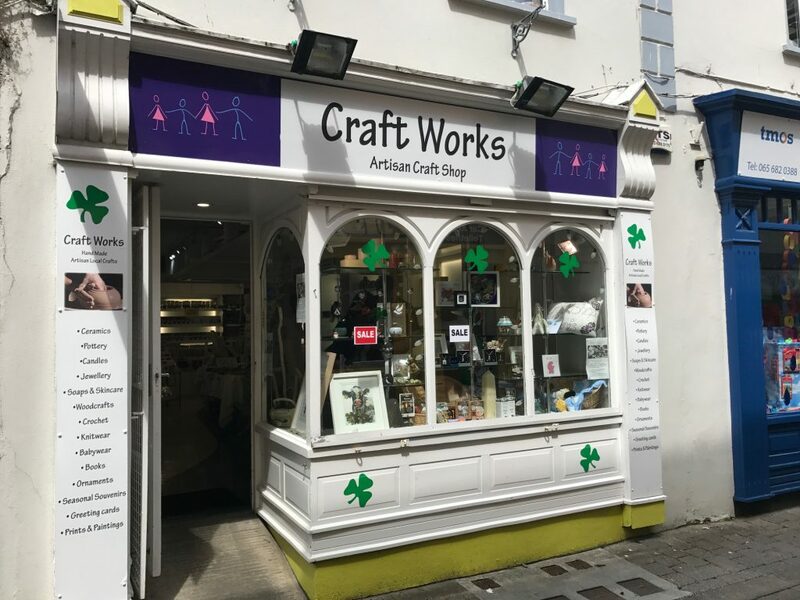 Craft Works sells local products, hand made within thirty miles of Ennis. 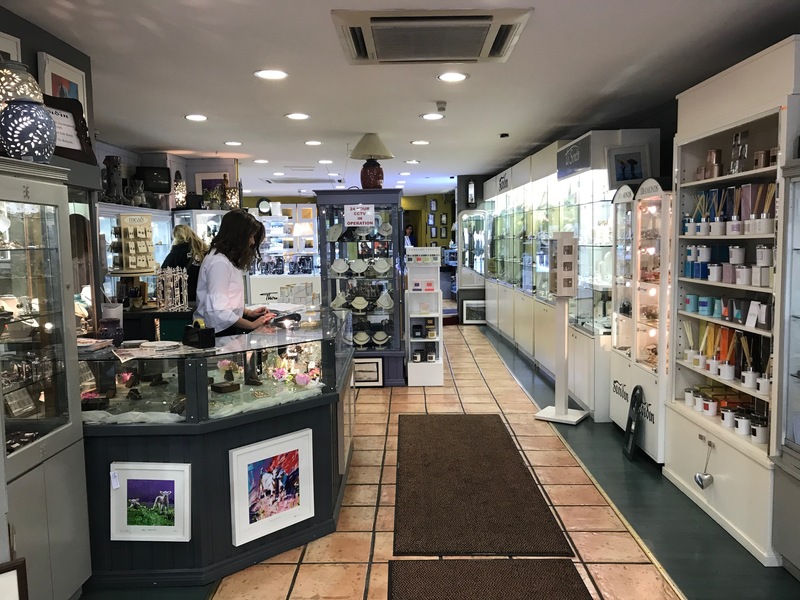 Seoidin sells handmade jewelry that is designed in Ireland. 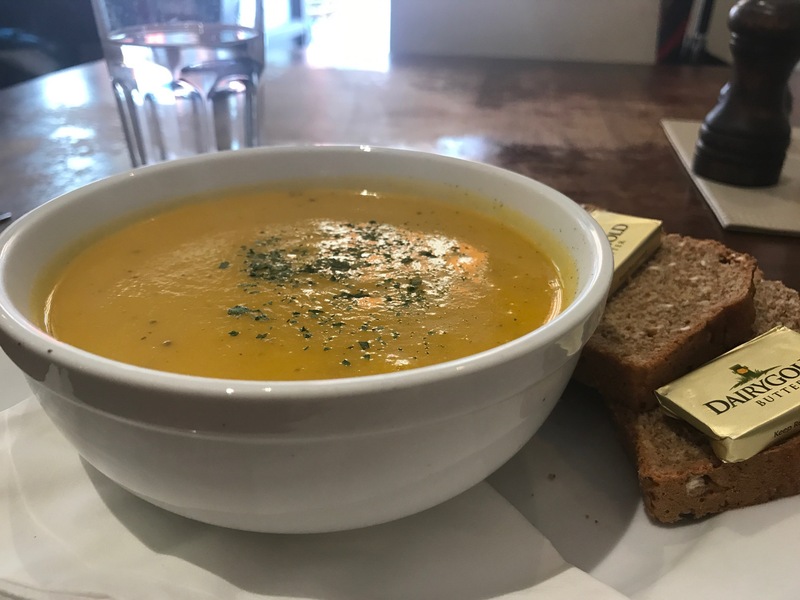 I ate lunch at the Souper Cafe and had a wonderful roasted vegetable soup that was so creamy without having any cream. My waiter told me it took them a long time to get the right consistency. 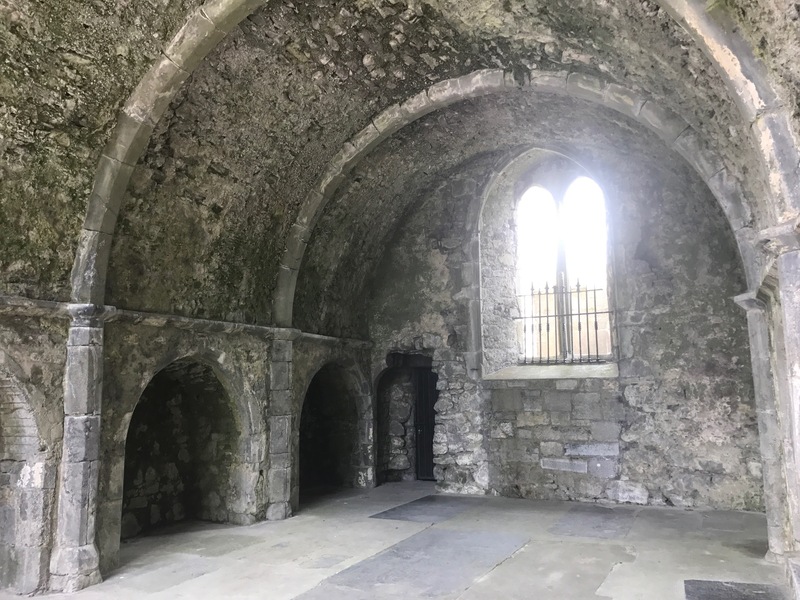 My final stop was the Ennis Friary. Established in the 13th century as a Franciscan friary. it is pretty much a ruin today. 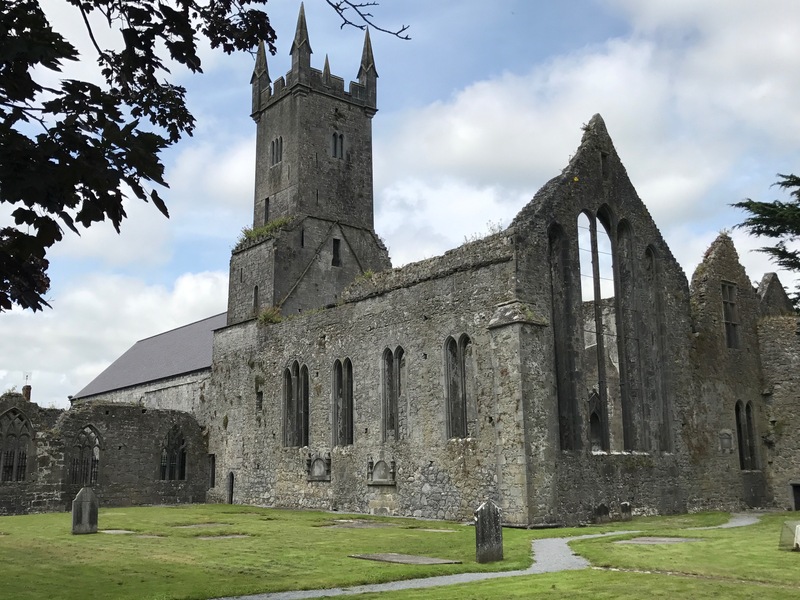 After learning about the history of the powerful O’Brien family in County Clare, I was not surprised to learn that they had established the friary. The guys got back early evening. This entry was posted in Ireland 2017 on July 14, 2017 by debbie. 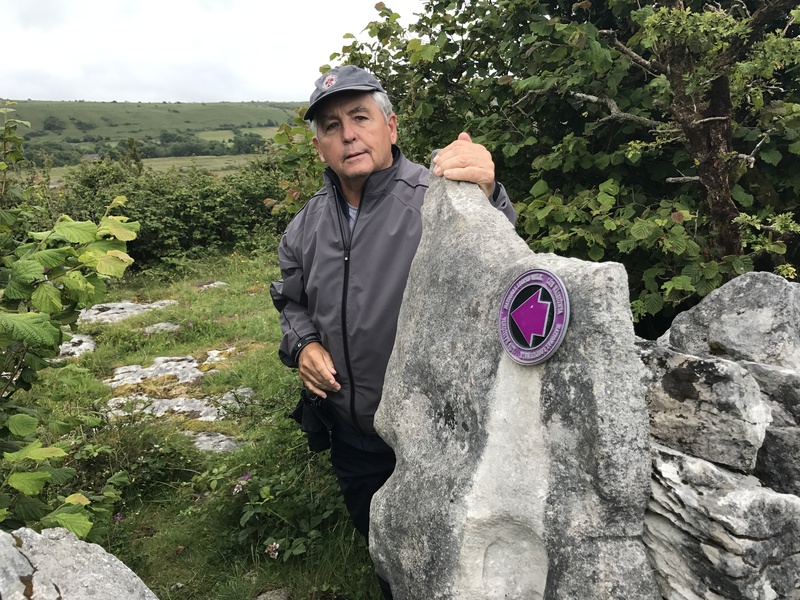 After getting settled in to the Glonomra B&B in Ennis, our home for the next three days, we headed to The Burren, a rocky, unique area in County Clare, to explore and hike. The limestone rocks and stark landscape were quite a change from the lush green forests of Killarney. 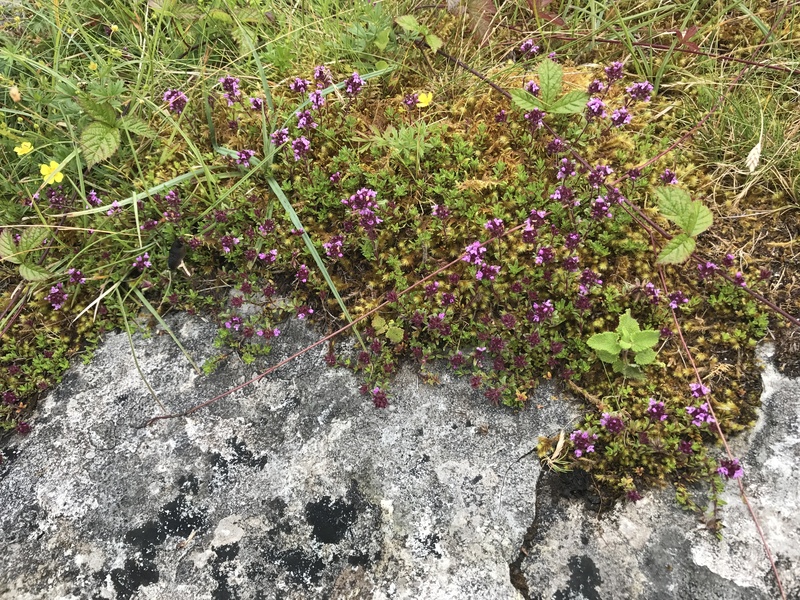 In spite of the rocky landscape, flowers and soft moss grew everywhere in this interesting area that supports arctic, Mediterranean and alpine plants side-by-side. We enjoyed the challenge of hiking on the rocky terrain. 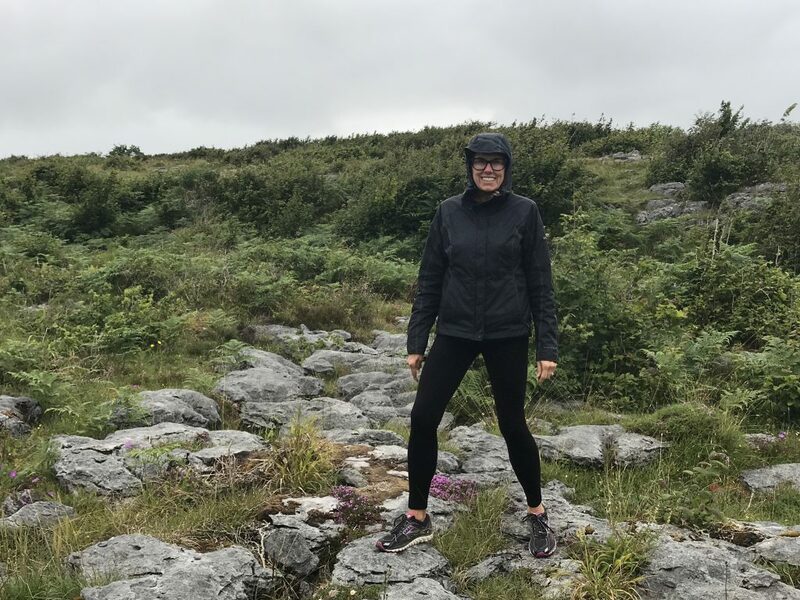 It drizzled for part of our hike, but I was prepared with my hooded, water-proof jacket. A visit to the Burren Perfumery was the highlight of my day. Paul was convinced no one used the tiny, winding road we took to get there, and we were both relieved to find the little perfumery. Located in a remote area of the Burren, it is a working factory, making all of its products on site. 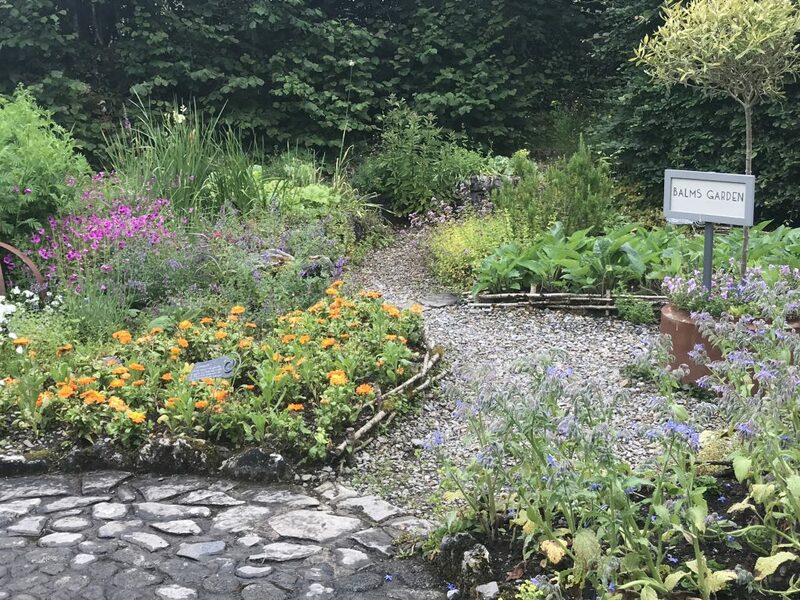 Walking through their lovely herb garden was a total delight. We ended our day with a lovely dinner and traditional Irish music at the Poet’s Bar. 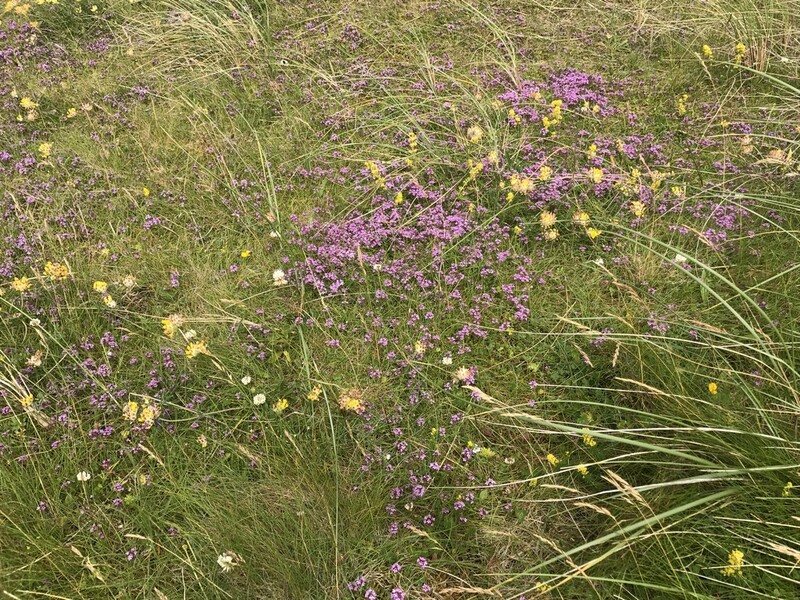 This entry was posted in Ireland 2017 on July 13, 2017 by debbie. Killarney National Park is so beautiful that we spent most of today and yesterday hiking its lovely and diverse routes. The first day we hiked two of the routes recommended by our concierge for a total of ten miles. 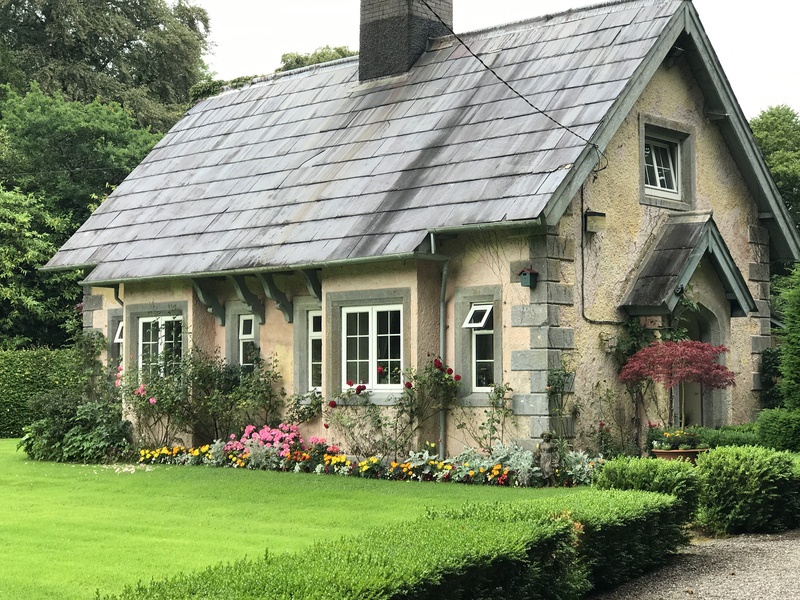 The first site we saw was this lovely little cottage that looked like something out of a storybook. At first the park seemed crowded, but I soon discovered that if you hiked a few miles out, you had wonderful options. Around every turn we were treated to beautiful views of hills and lakes. 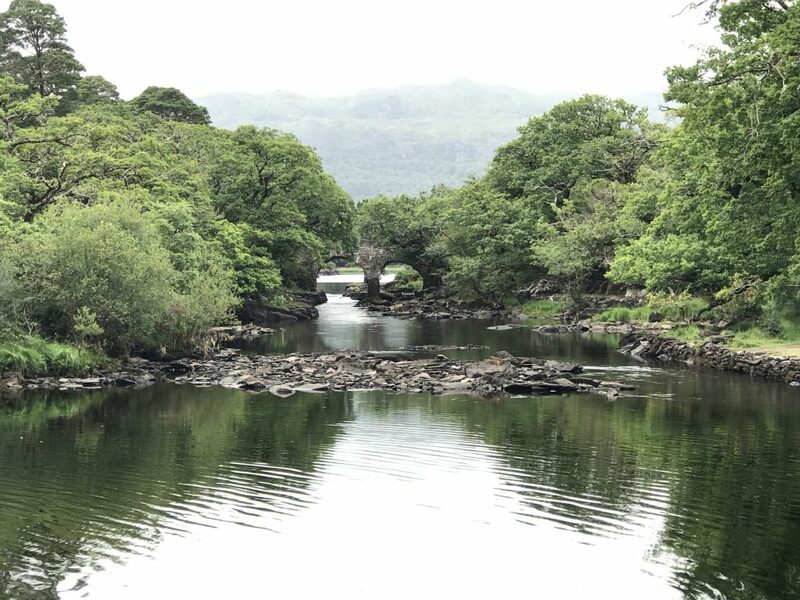 Our first hike took us around Middle Lake, past the The Old Weir Bridge and the Meeting of the Waters where the lakes of Killarney National Park converge. It was fun to leave the main hiking route and explore the little side paths. 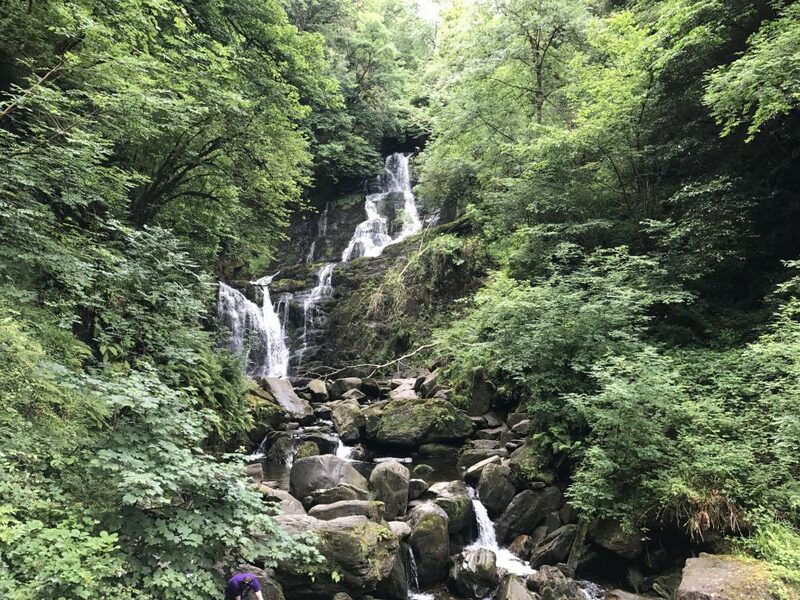 On our second hike we took the yellow circular route past the Toric Waterfall and many very steep steps. 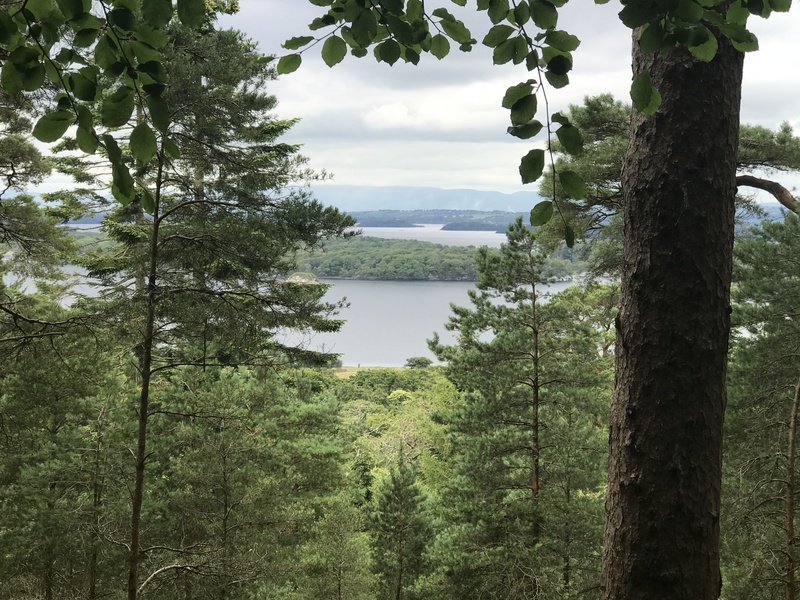 The oldest national park in Ireland, Killarney National Park was created when Muckross Estates was donated to the country in 1932. 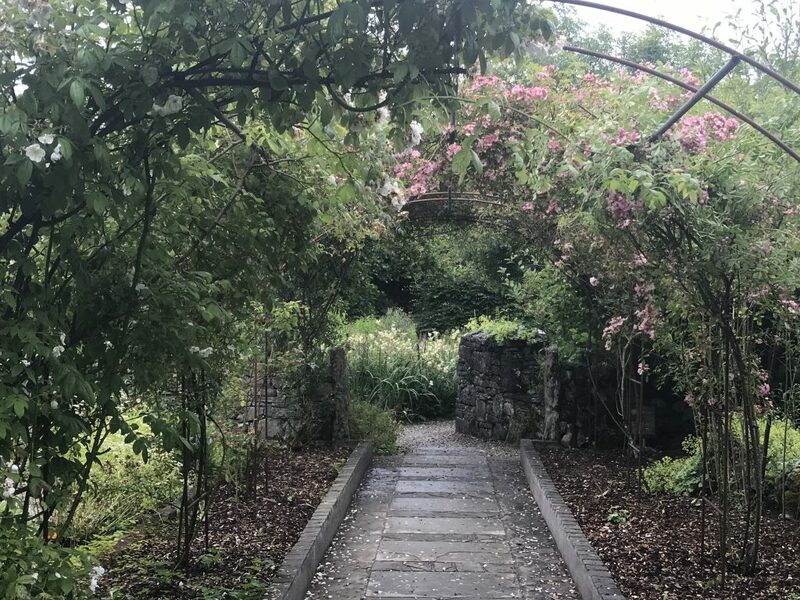 We started our second day at the park with a guided tour of the Muckross House and its lovely gardens. Our guide was entertaining and informative. We learned that the phrases “saving face” and “mind your own beeswax” came from the 19th century when women used beeswax on their faces to maintain a pale, flawless look. The heat from the fireplaces could cause their faces to melt, so they had little screens to keep the heat from their faces. 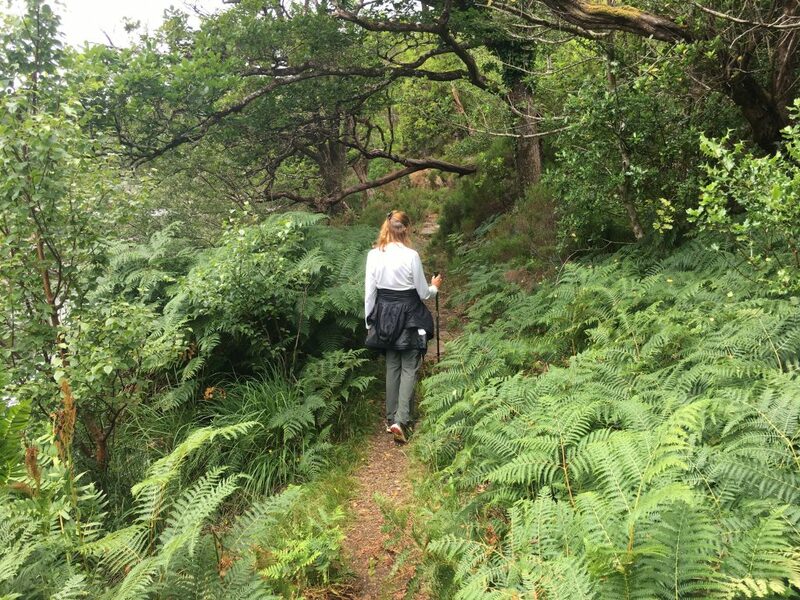 From there we hiked to the Muckross Abbey. 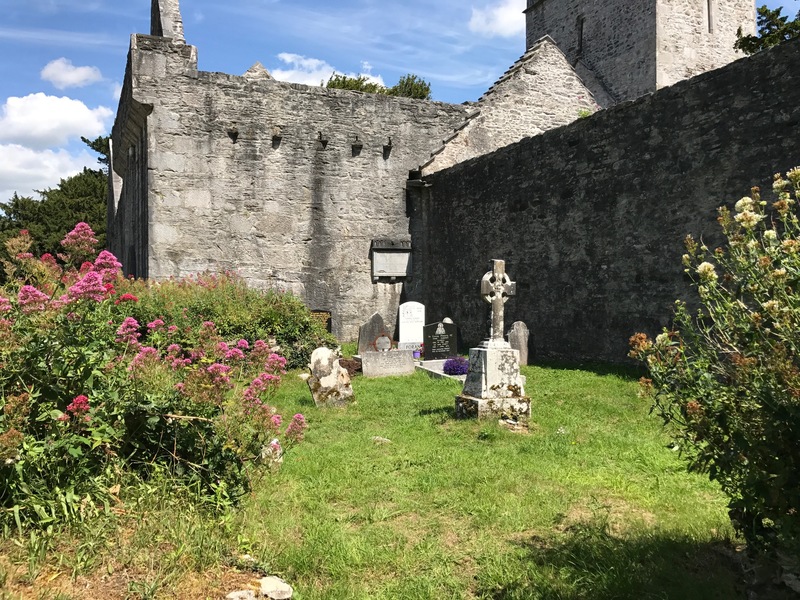 Founded in 1448 as a Franciscan friary, today most of the roof is gone, but the walls still stand and the cemetery has relatively recent burials. Our final hike was to Ross Castle. a 15th century tower House. 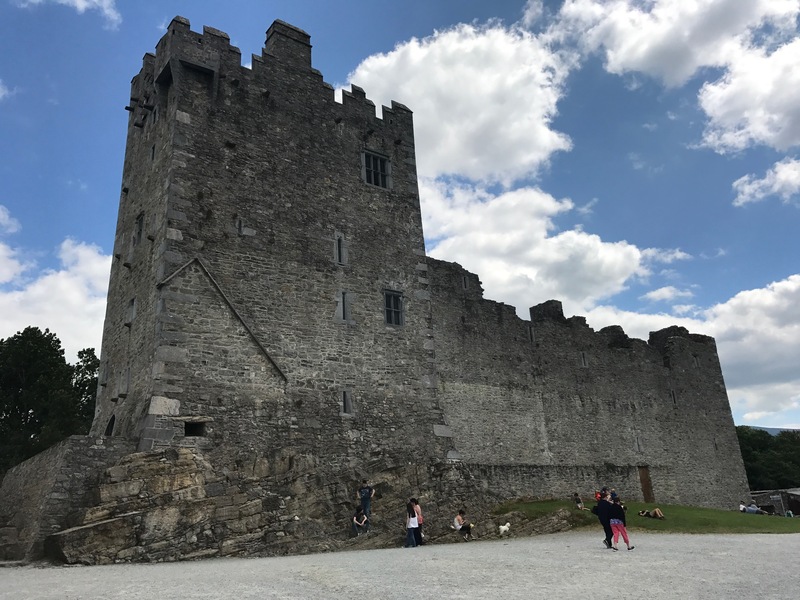 We were a bit surprised to see so many people when we got to the castle and then discovered that tour buses and cars could drive to the castle on a different route. Leaving the castle to hike back we were once again in the beautiful park forest. We ended our last night in Killarney with a lovely three-course meal at our hotel. 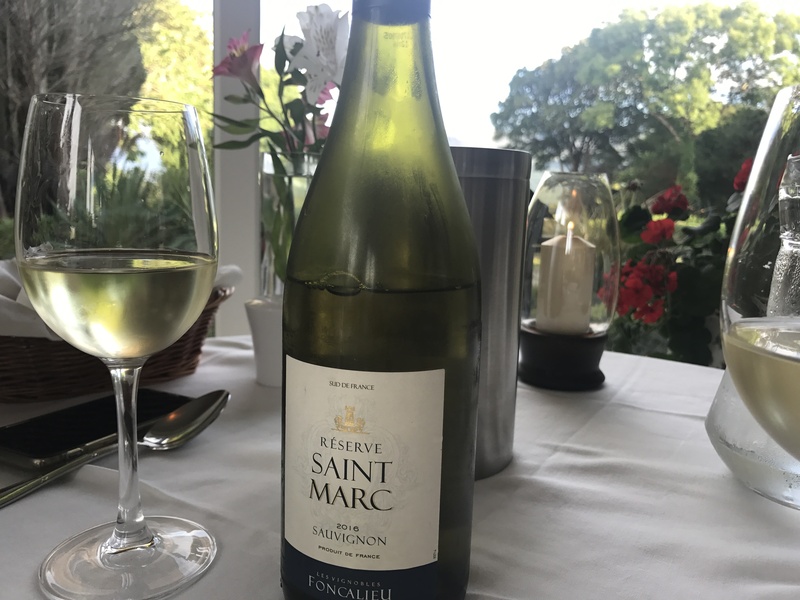 Our concierge/wine steward/owner recommended a new wine we had never tried and it went great with Paul’s chicken and my salmon. It was a perfect ending to a perfect three days. 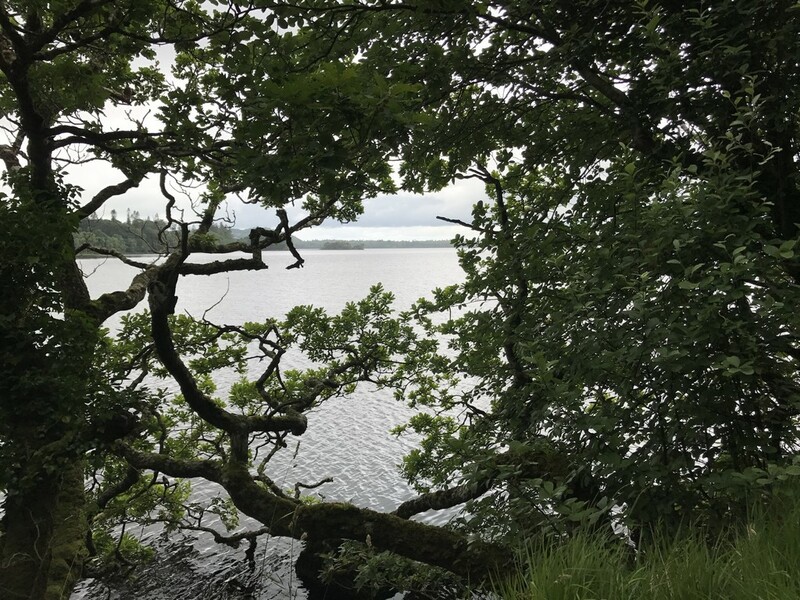 This entry was posted in Ireland 2017 on July 12, 2017 by debbie. 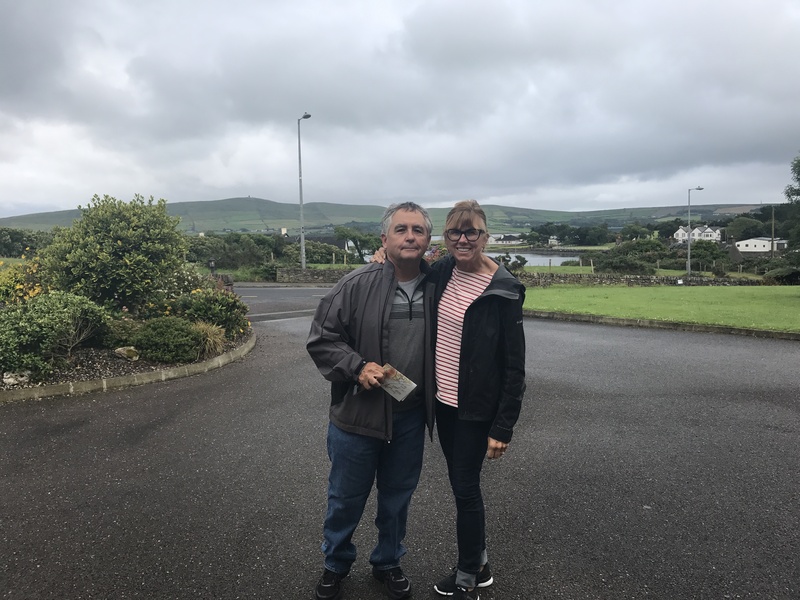 Yesterday we said farewell to our wonderful Pearse Lodge B&B hosts, Mary and Kieron and began our six-hour drive to Dingle. 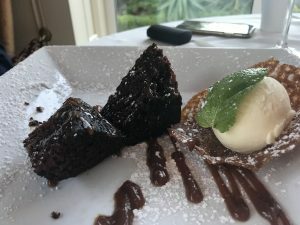 From their perfect cup of coffee and the best-ever butter to the spot-on recommendations and wonderful conversations, they made our stay in Sligo extra special. 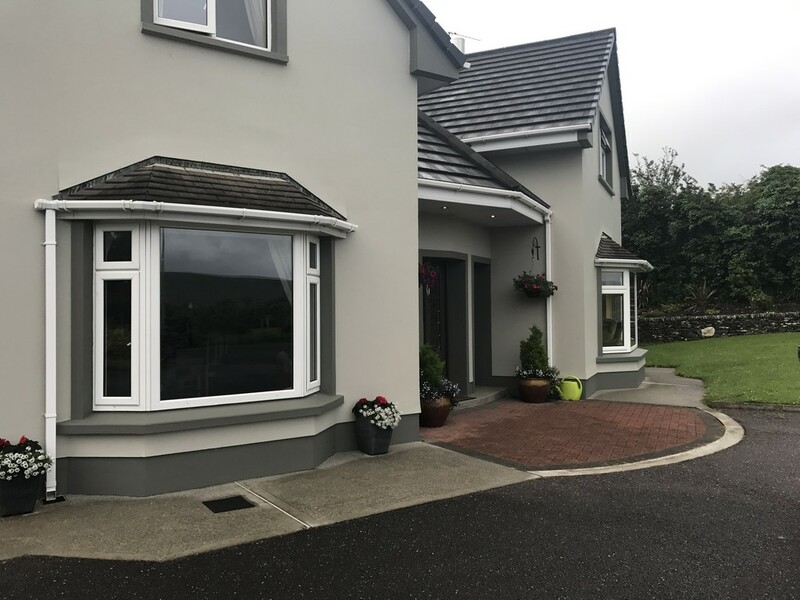 Chilly, drizzly weather greeted us as we drove into Dingle, but our Towerview B&B hosts, Helen and Aiden, welcomed us to their cozy B&B with its beautiful views. 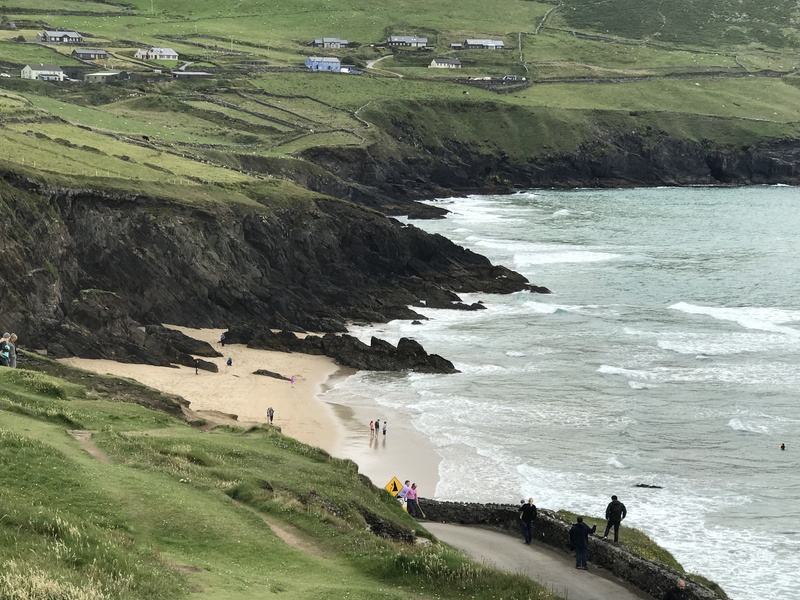 We spent the next morning exploring more of delightful Dingle and then took the Slea Head Drive around the perimeter of the Dingle Peninsula. Stunning views of hills, pastures and seas enchanted us. The road is so narrow that most people drive clockwise. The few times we encountered a counterclockwise traveler on a narrow spot, one of us had to pull over. Our B&B host, Aiden, gave us great advice about which sites to see along the drive. Our first stop was the Beehive Huts. 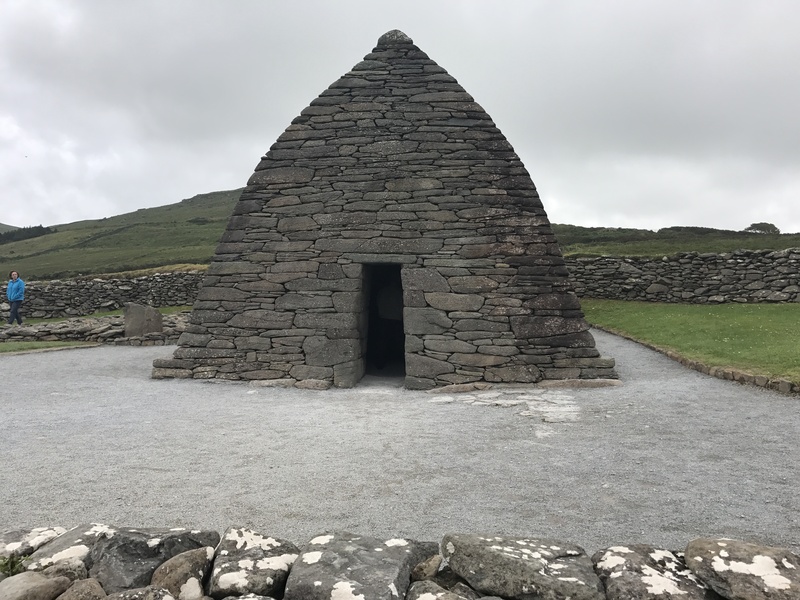 These little stone huts were inhabited from ancient times to about 1200 AD. Made without mortar, these amazing structures are designed with stones set downward and outward to shed water. 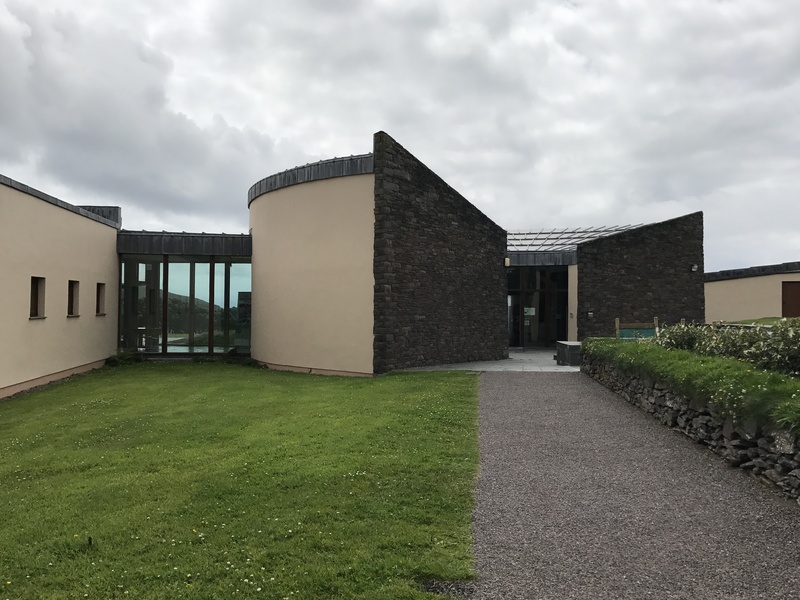 Next stop was The Blasket Centre, a beautiful modern building that told the story of the Blasket Islands. Because the islands were so isolated, inhabitants retained their culture, including speaking Irish. 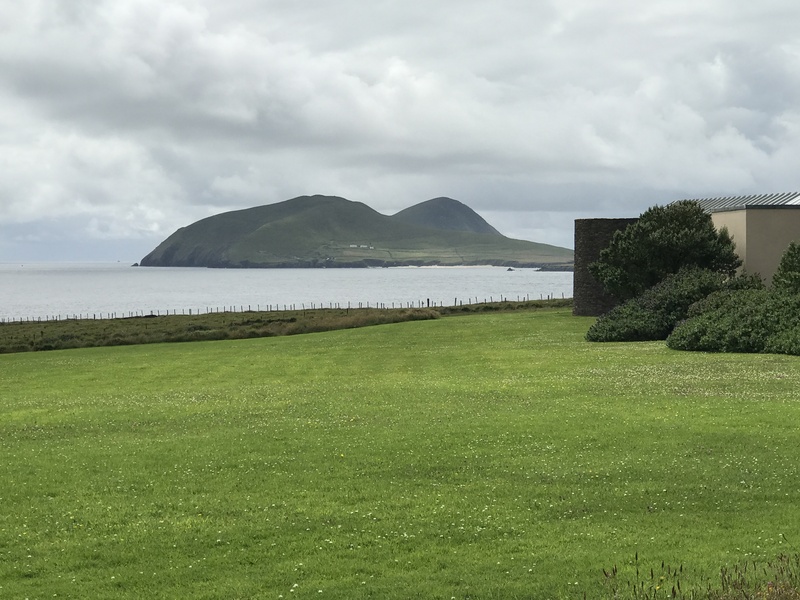 Scholars who wanted to learn about the native traditions and language visited the island and encouraged the islanders to write their life stories. Life on the islands, which are 5 km from the coast, was harsh, and in 1953 the last inhabitants left Great Blasket Island. 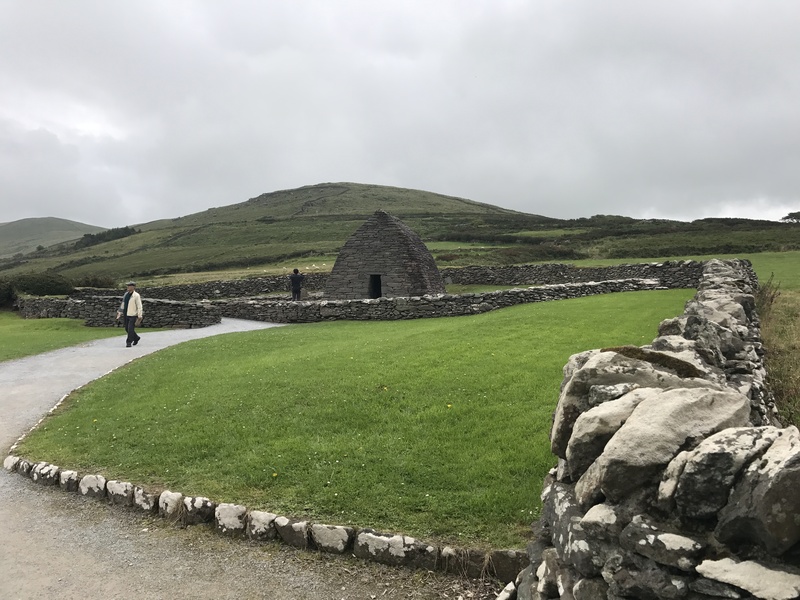 The Gallarus Oratory was the final stop on our Slea Head Drive. 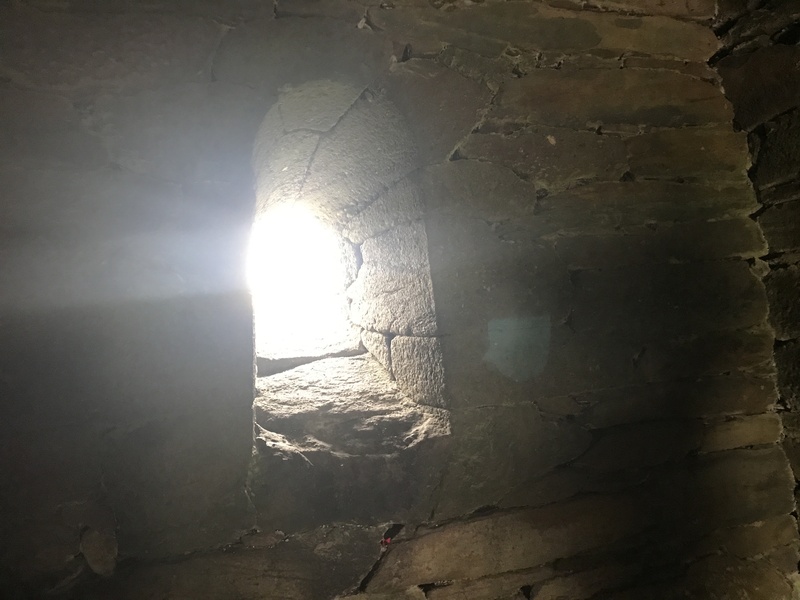 Built by early Christians about 1300 years ago, it’s original purpose is unclear. Stone church, funerary chapel and shelter for pilgrims have all been proposed as possible uses. The building has a small door on the west side and a round window on the east. Luckily, we walked inside as the sun was shining through the window. We drove about an hour to Killarney and checked in to the Loch Lein Country House Hotel, our home for the next three nights. 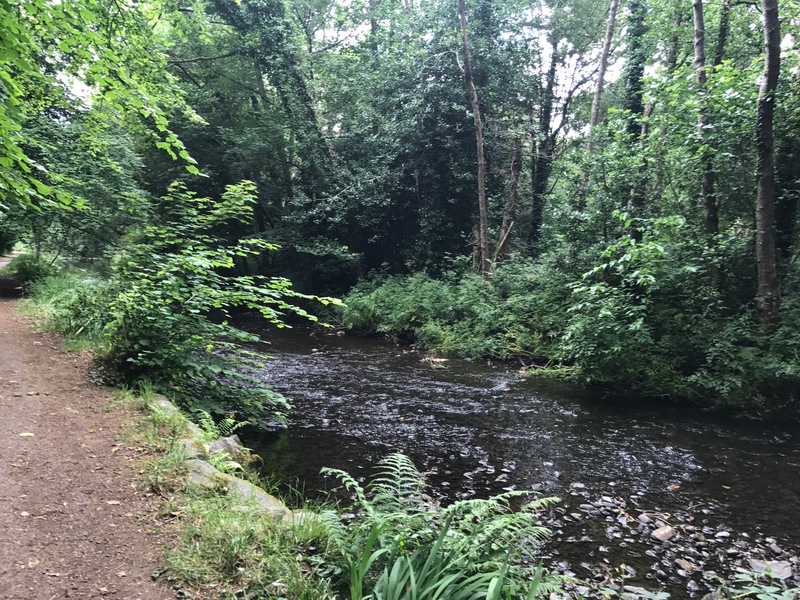 This entry was posted in Ireland 2017 on July 10, 2017 by debbie. Our last day in Sligo wasn’t in Sligo. 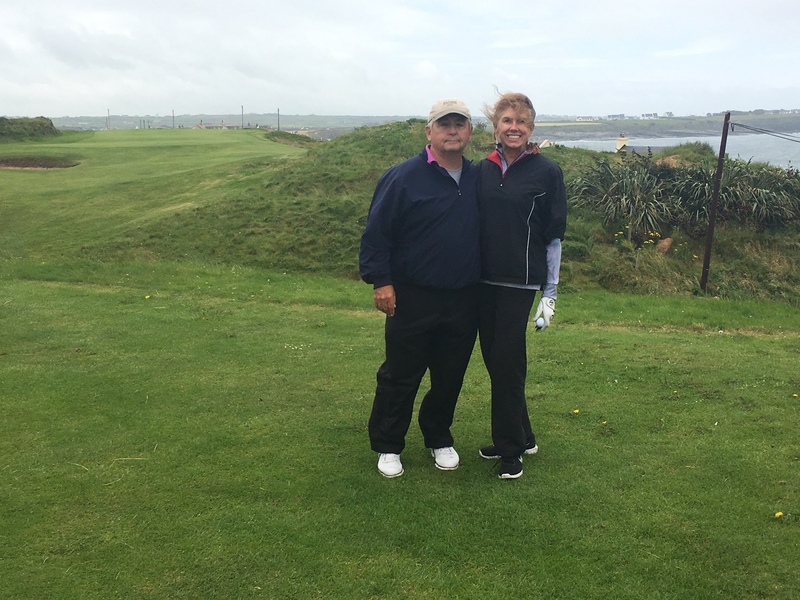 After breakfast we headed two hours west to play a new golf course Paul was inspired to try. 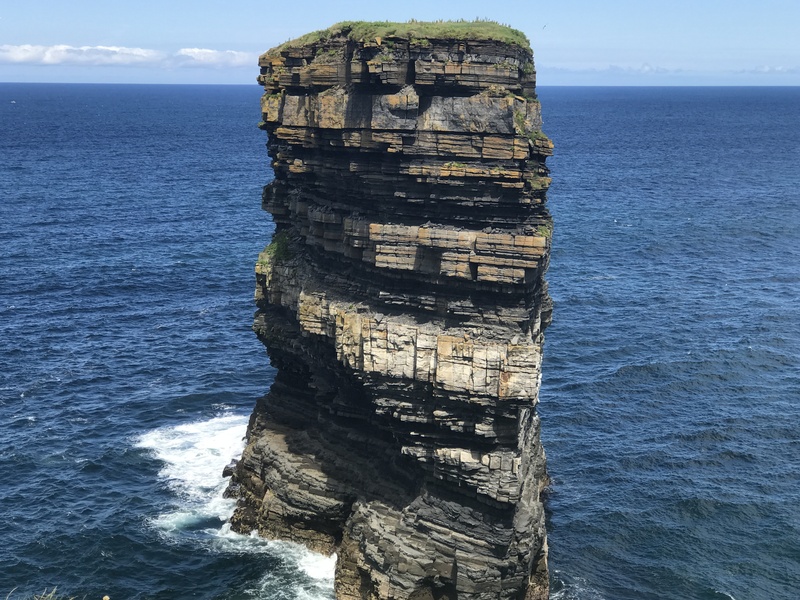 Thanks to a recommendation from our fabulous B&B hostess, Mary, we made a side trip on the way to see Downpatrick Head, an amazing rock outcropping just off the coast in the Atlantic Ocean. 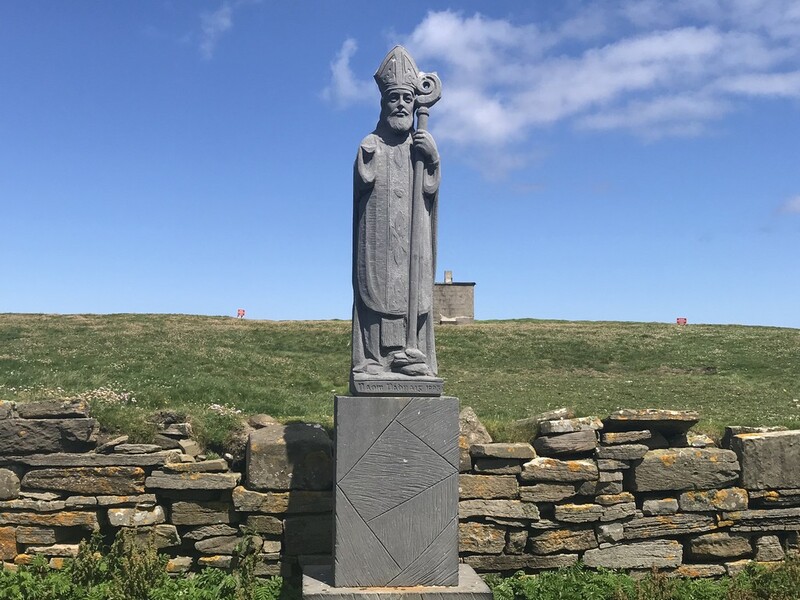 Downpatrick Head gets its name from St. Patrick who founded a church here. People still gather at this sacred site on the last Sunday in July to hear mass. 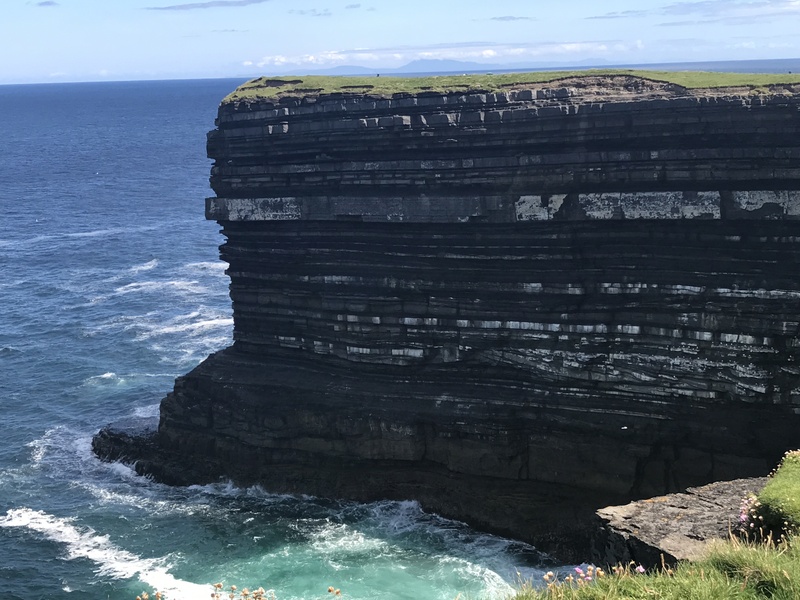 We saw a few people walking toward the cliff with what looked like huge fishing rods and couldn’t imagine how any one could fish from such a high cliff. 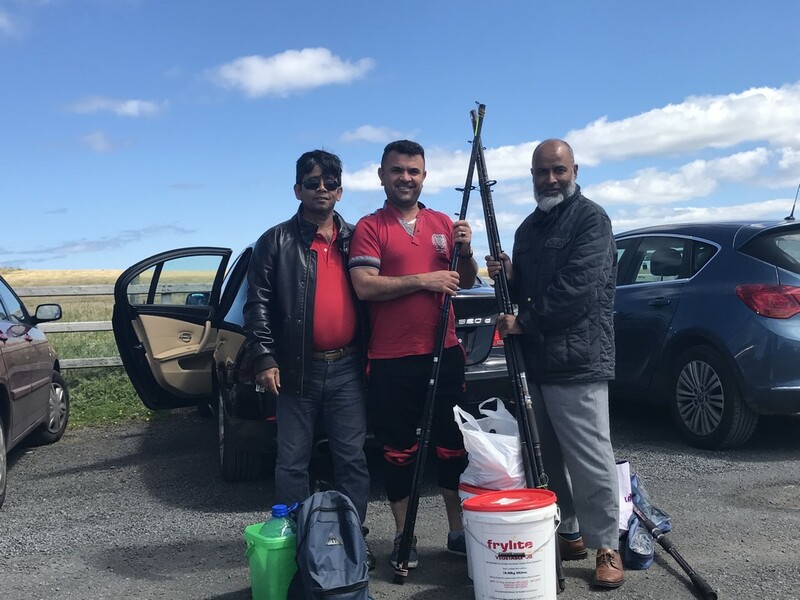 On our way out we talked with three men unloading fishing gear from their car who told us they were on their way to fish for mackerel off the cliff. I wanted to stay and see how they did it, but we had a tee time scheduled. 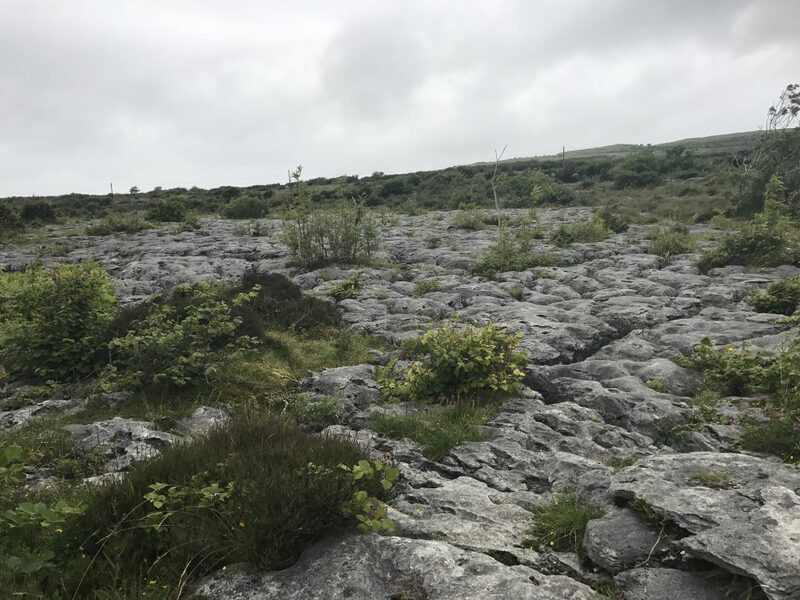 This entry was posted in Ireland 2017 on July 9, 2017 by debbie. 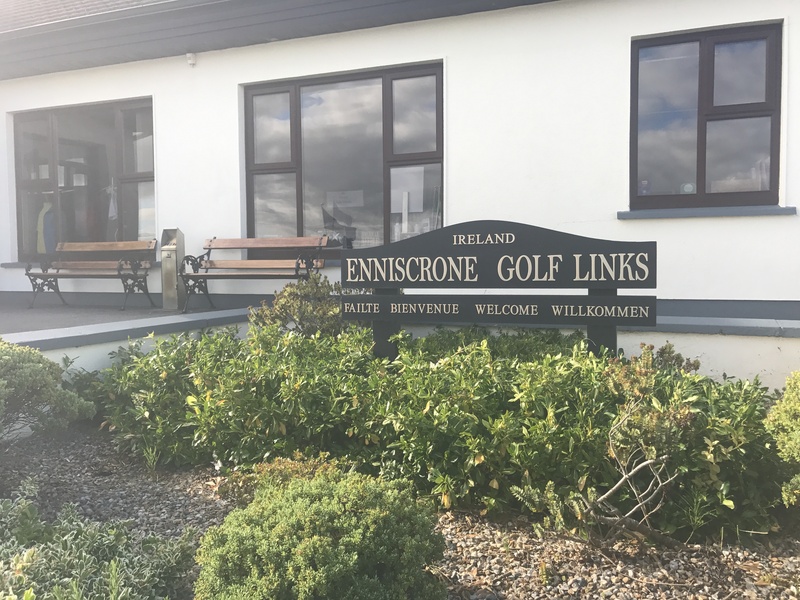 After another wonderful breakfast, we traveled about 45 minutes to Enniscrone Golf Club to play another course Paul read about in A Course Called Ireland. 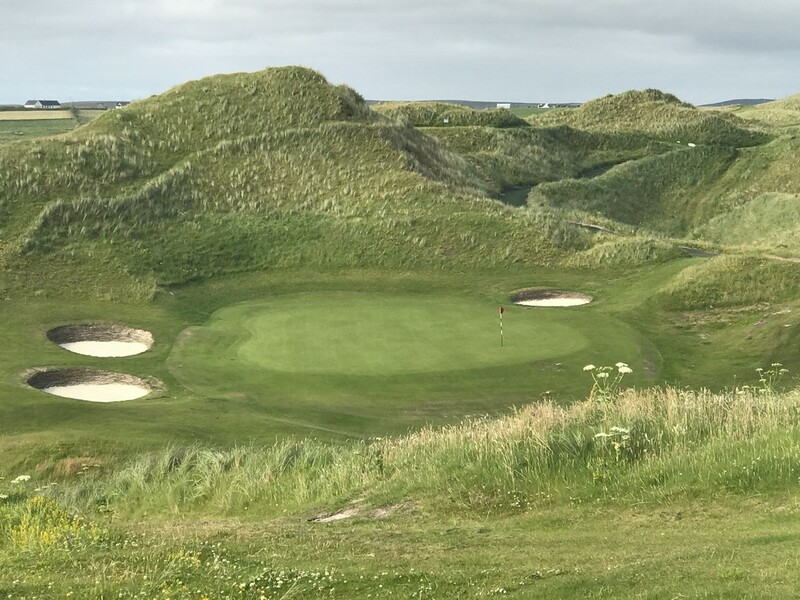 A links course with a lot of elevation changes located on the Atlantic Ocean, it had holes that were both beautiful and extremely challenging. 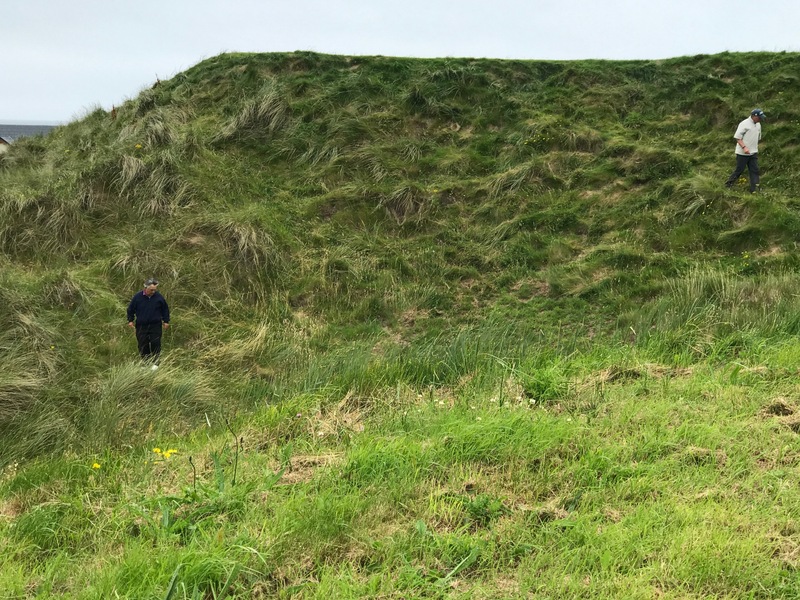 The blind holes and thick rough are so challenging that the pro-shop recommended we take a caddy so we wouldn’t spend lots of time looking for lost balls. We passed on the caddy but got a course guide that was very helpful. I focused more on not losing any golf balls than on getting a great score, and I did pretty well until hole #12. At the end of the round I had only lost one ball, and my score was OK, all things considered. 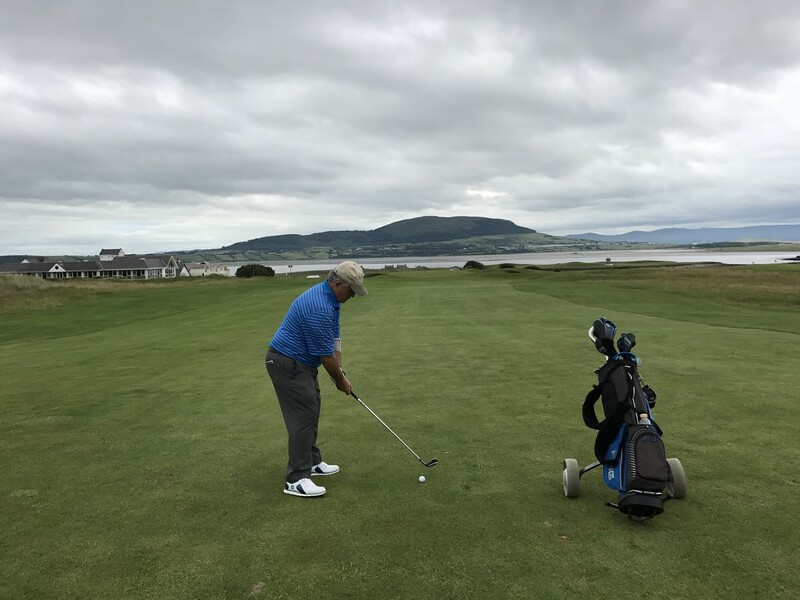 It was a great golf day-challenging and scenic. 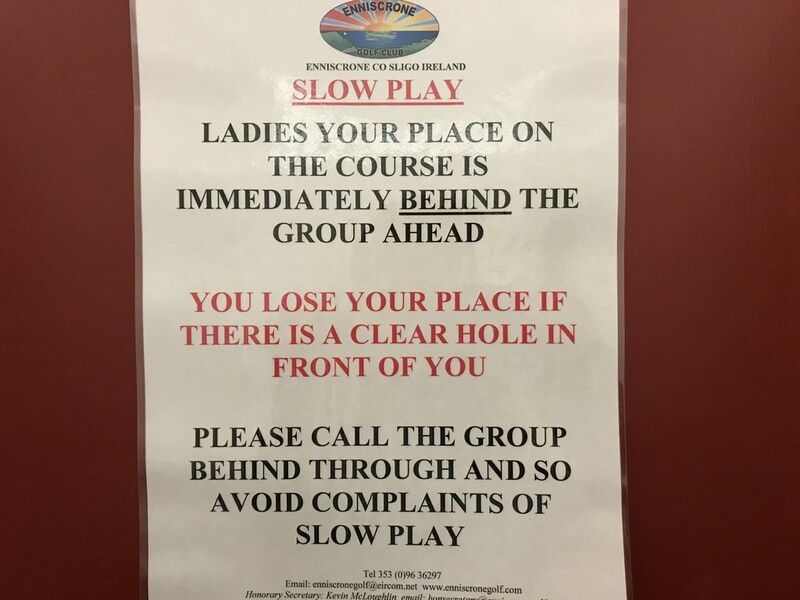 There was an interesting sign in the ladies’ locker room. 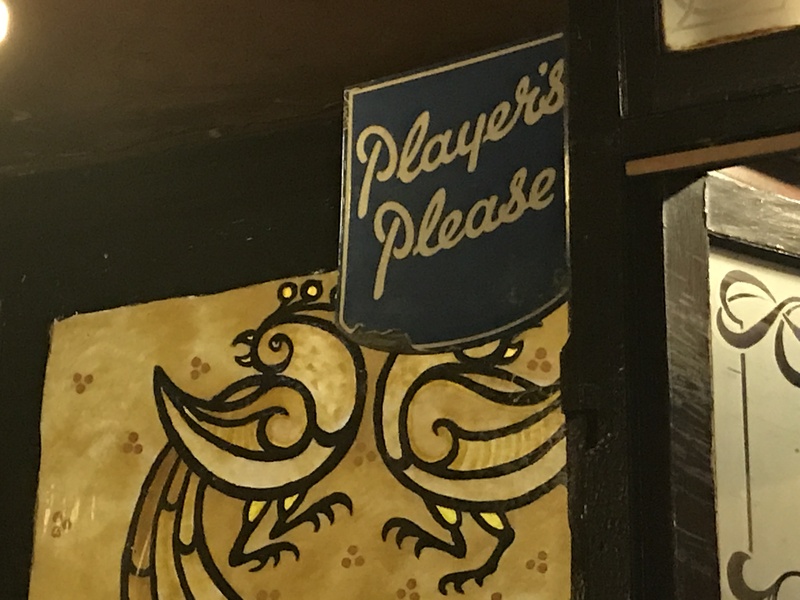 Paul said he did not notice a comparable sign in the men’s locker room. We ate dinner in the clubhouse, and I finally got my fish and chips. 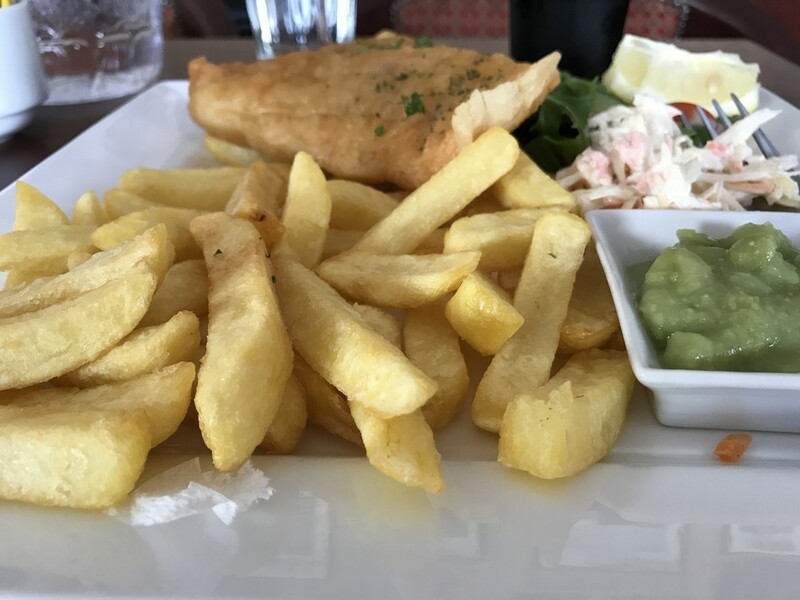 The little green glob in the dish is mushy peas, a pretty common fish and chips accompaniment. 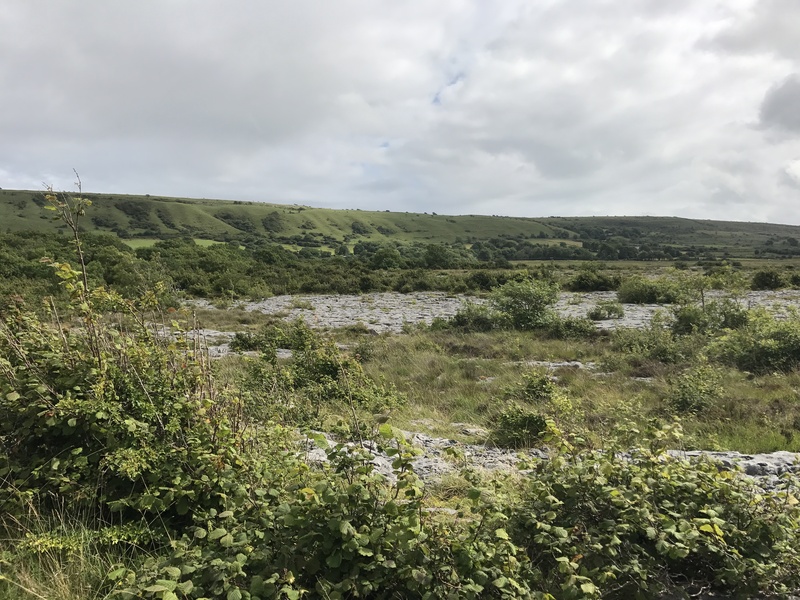 This entry was posted in Ireland 2017 on July 7, 2017 by debbie. 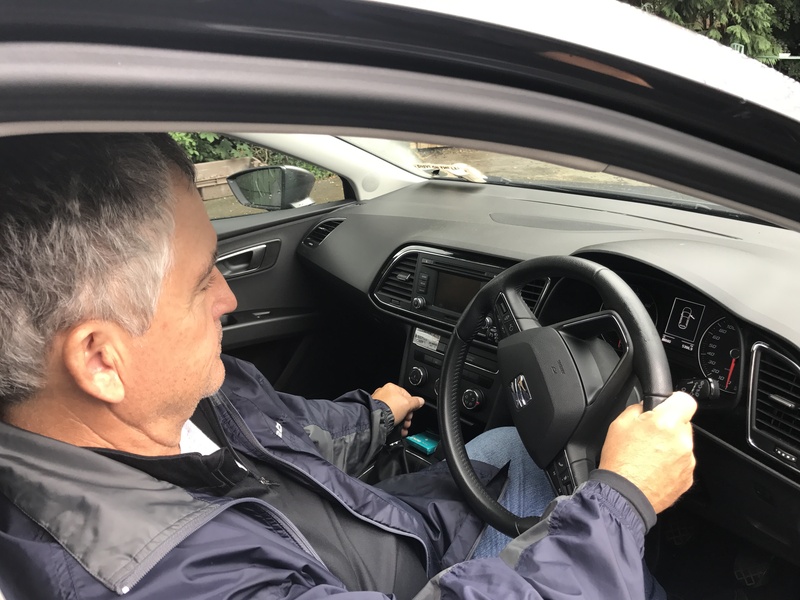 After a couple of days of jerky starts, Paul “mastered” driving a shift stick on the opposite side of the road. I knew it wouldn’t take him long. 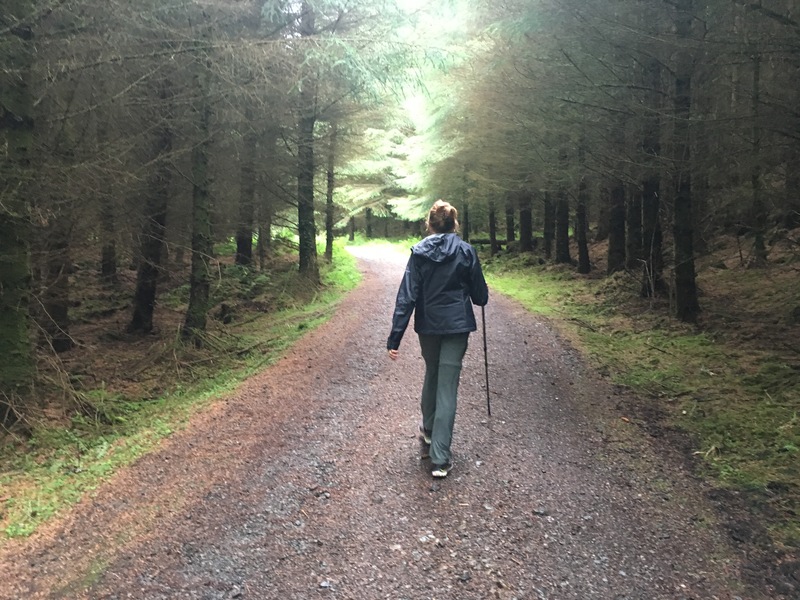 Before our trip, I consulted a great hiking website, Sligo Walks, and planned to use it for our hiking routes.. 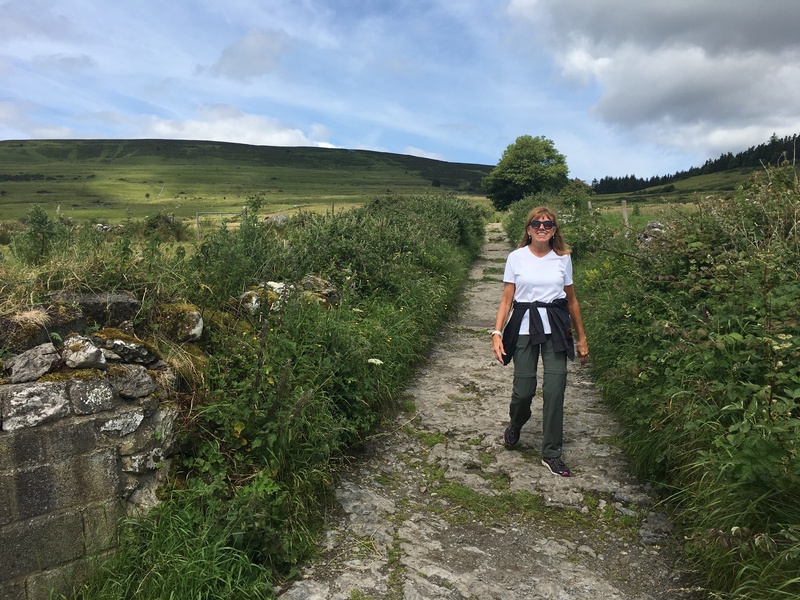 But once we arrived in Sligo, the expert advice of our B&B hosts was all we needed to choose and navigate great hikes. 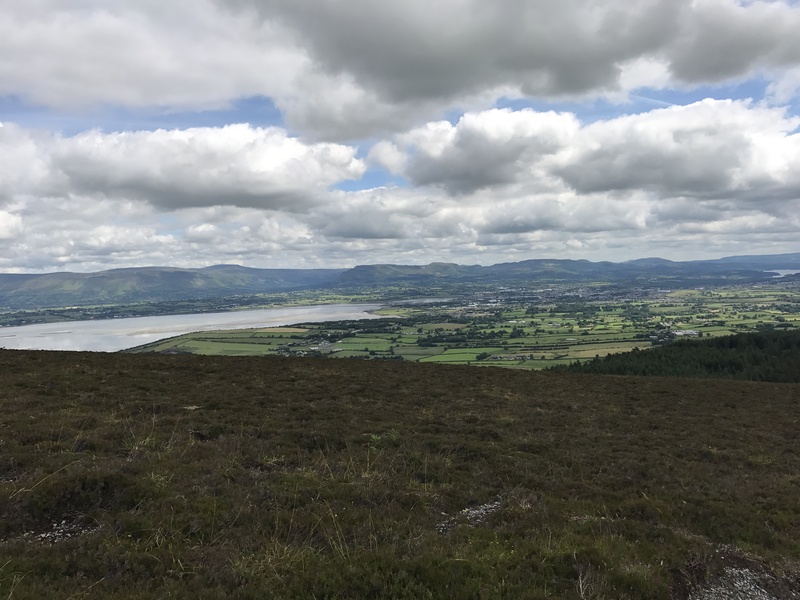 Today they directed us to Section 7 of the Sligo Way, a beautiful 80km hike. Our hike began in an enchantingly beautiful forest. 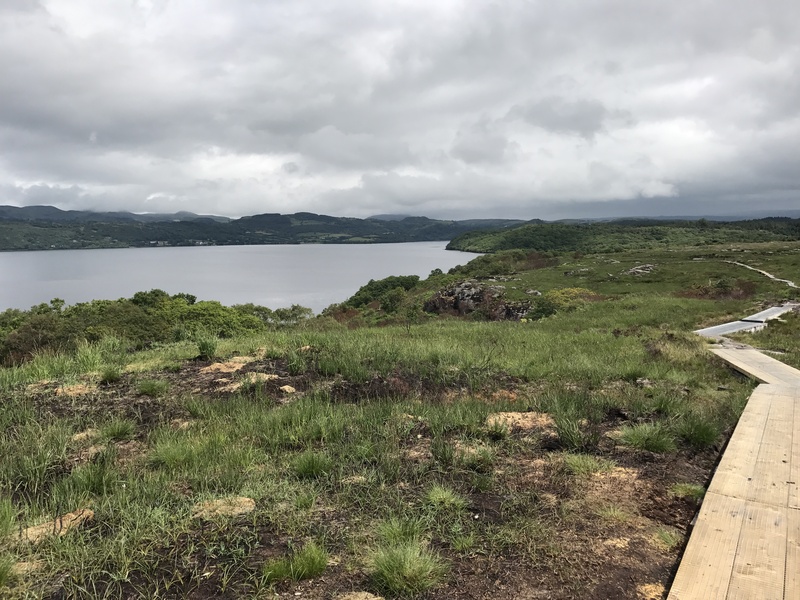 It wasn’t long before we got our first view of beautiful Lough Gill. A major part of the hike was over a board walk through peat bogs. 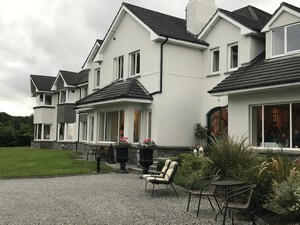 Dried peat, called turf, is still used in some Irish homes for heating. 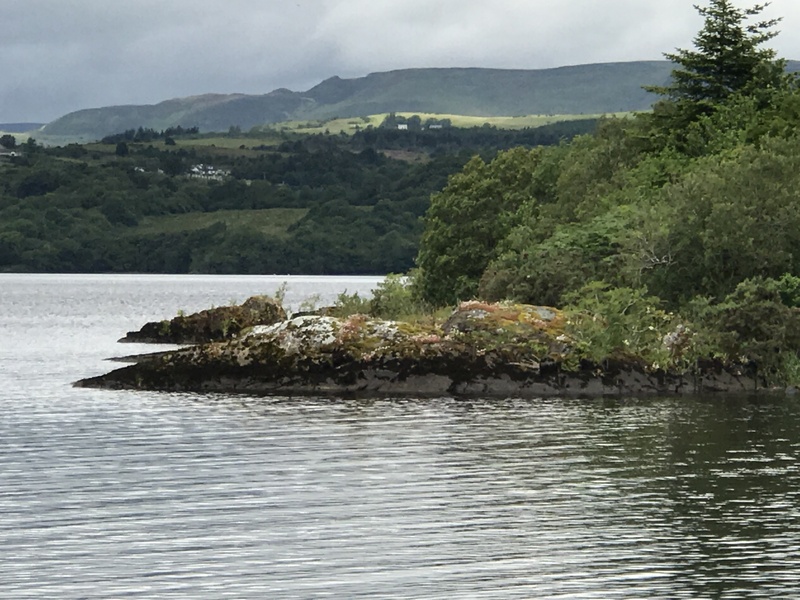 Two women we met on the trail told us about an unmarked path that led to the shore of Lough Gill. The heartier of the two had even been swimming in the lake earlier. Although I was warm enough to take off my jacket, I couldn’t imaging swimming in the lake. Thanks to their tip, we found the path. 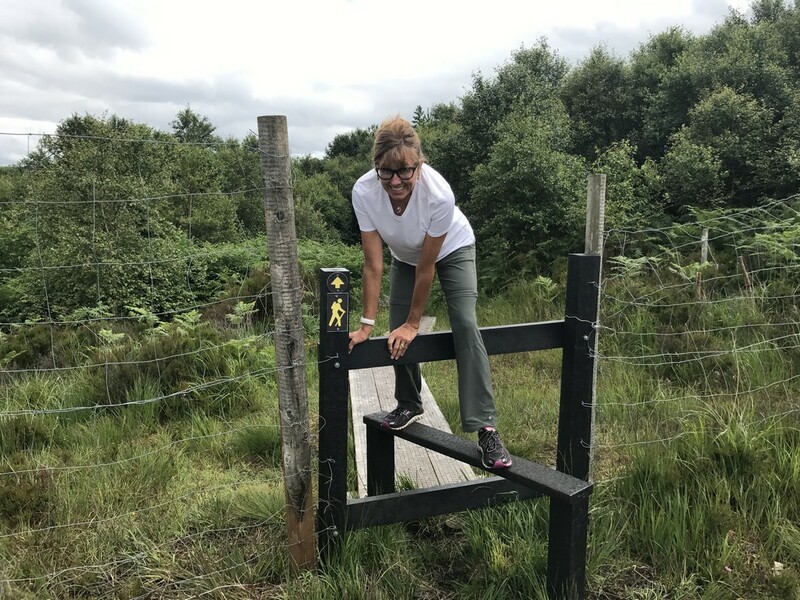 Part of our hike included using an interesting wooden structure to climb over a fence. 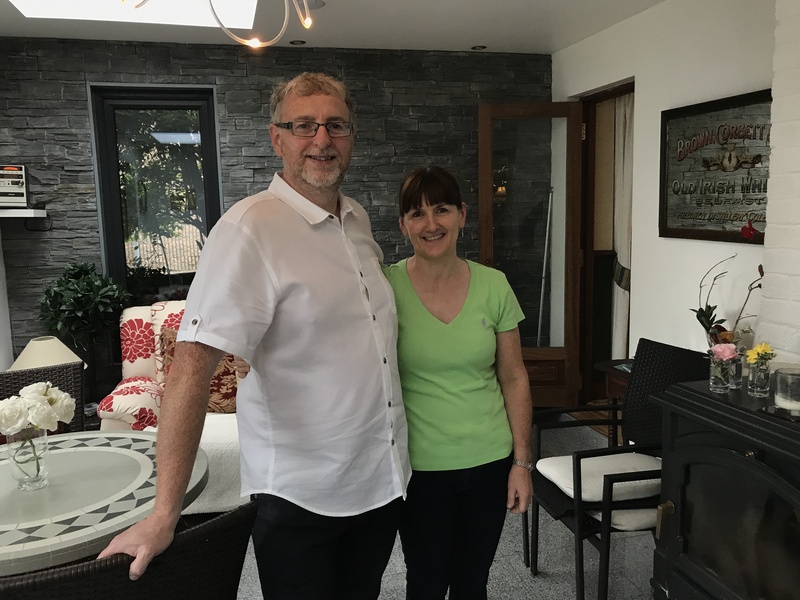 We ate a wonderful dinner at Coach Lane, highly recommended by our B&B hosts. 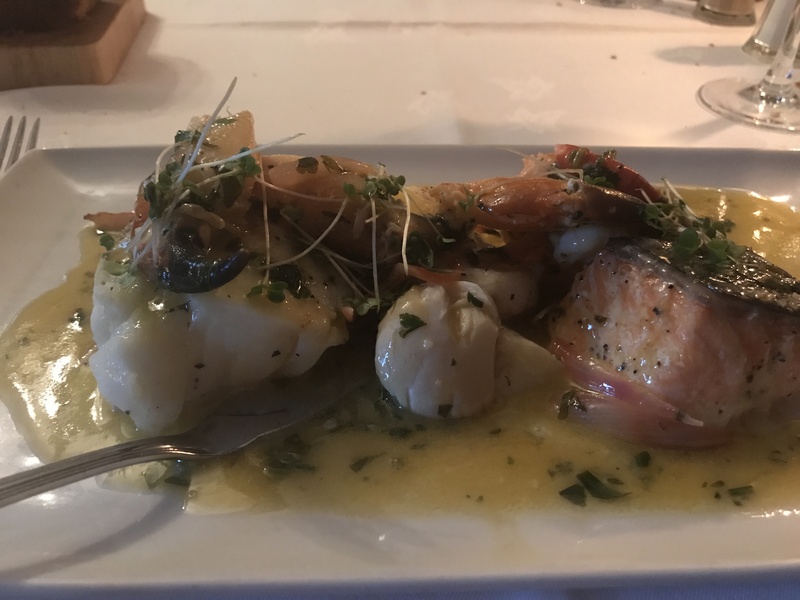 I had a seafood platter of salmon, shrimp, crab, cod and halibut, all locally caught and grilled in a tasty lemon champagne sauce. 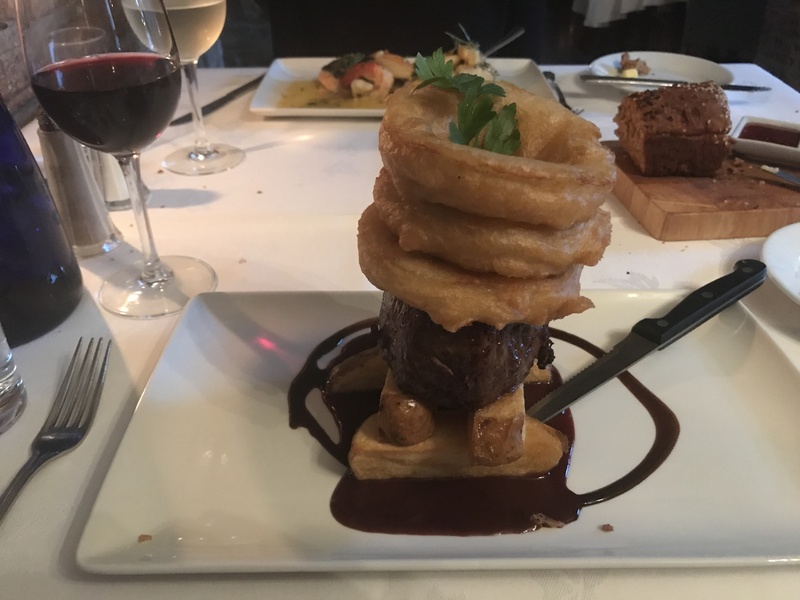 Paul tried the steak we had heard so much about. 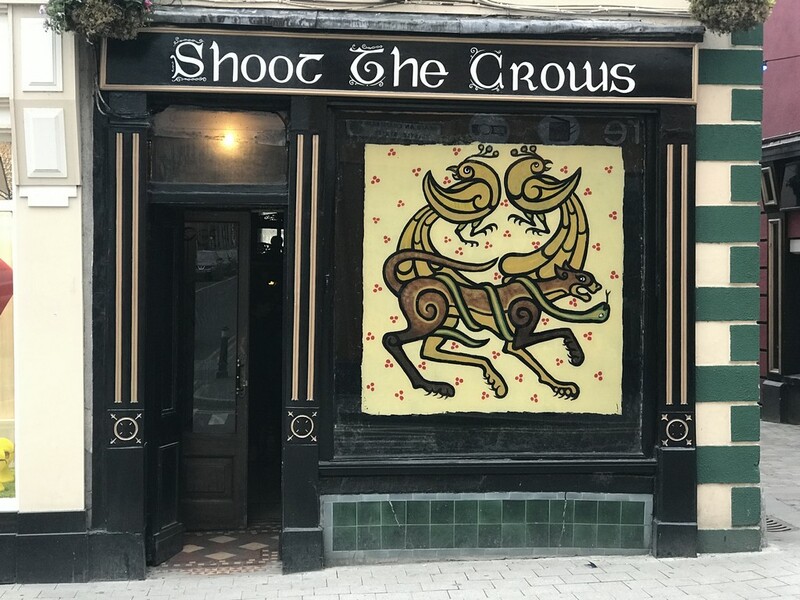 After dinner we went to hear traditional Irish music at Shoot the Crows, an Irish pub recommended by both Tom Coyne and our B&B hosts. Arriving right before the music started at ten, we felt lucky to get a seat because by eleven, it was hard to find a place to stand. A small table in the front is reserved for the musicians. The musicians sat around a table facing each other, not the audience. More musicians joined the group later, and when we left around midnight, six musicians were playing together. I started my day in breakfast heaven. 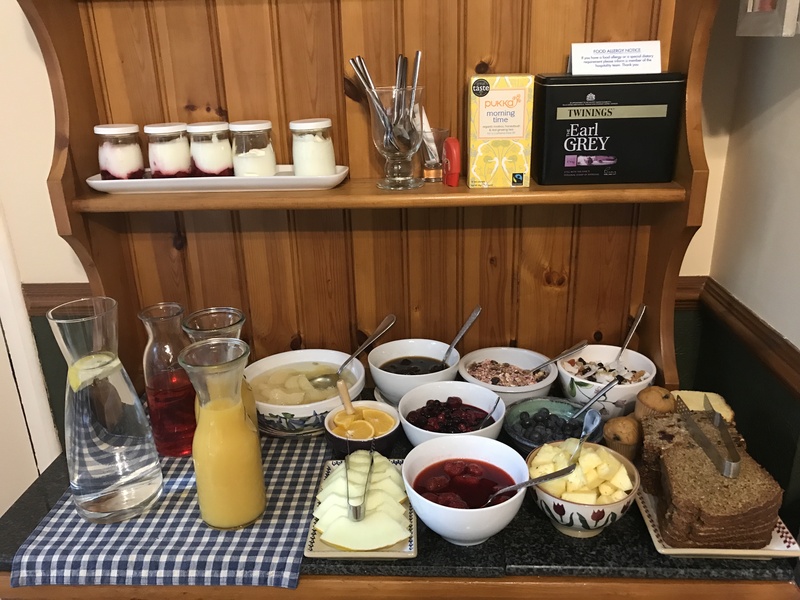 Mary, our B&B hostess, is a foodie who has mastered the perfect cup of coffee, makes amazing homemade yogurt, and just all-around serves the most delicious breakfast. As a person who starts her day with a green smoothie and doesn’t really like most traditional breakfast foods, I was delighted. 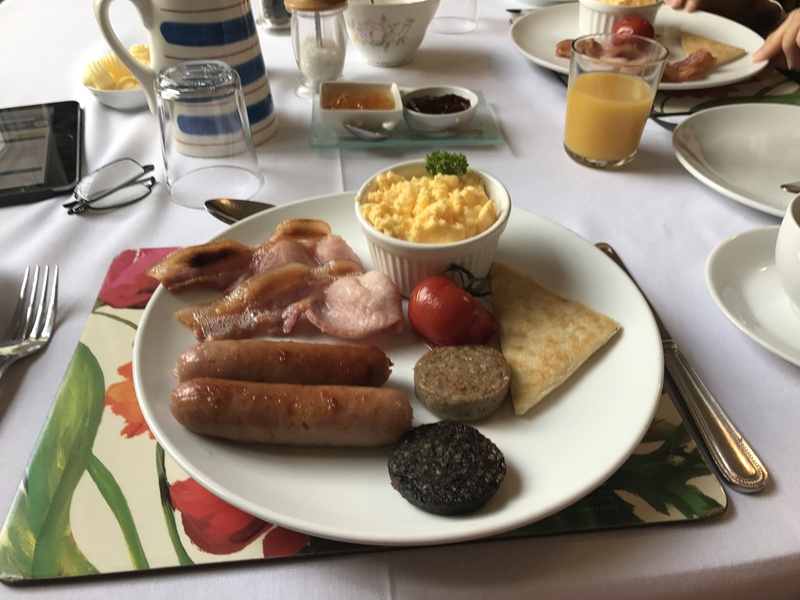 Paul loved his full Irish breakfast. We expected our first stop at the megalithic cemetery at Carrowmore, the largest of its type in Ireland and one of the oldest in Europe, to be a brief look at some cairns (stone burial monuments), and were pleasantly surprised to join a tour of the site. 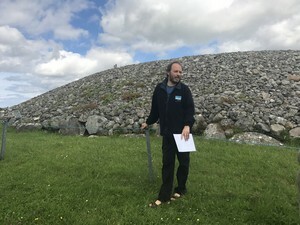 Martin, our impressively knowledgeable guide, gave us a fascinating history of this neolithic burial site that is about 6000 years old. 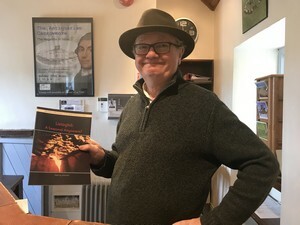 As we were leaving we met the author of a recently published book who discovered how the tombs had been oriented to allow the sun to enter at strategic times. 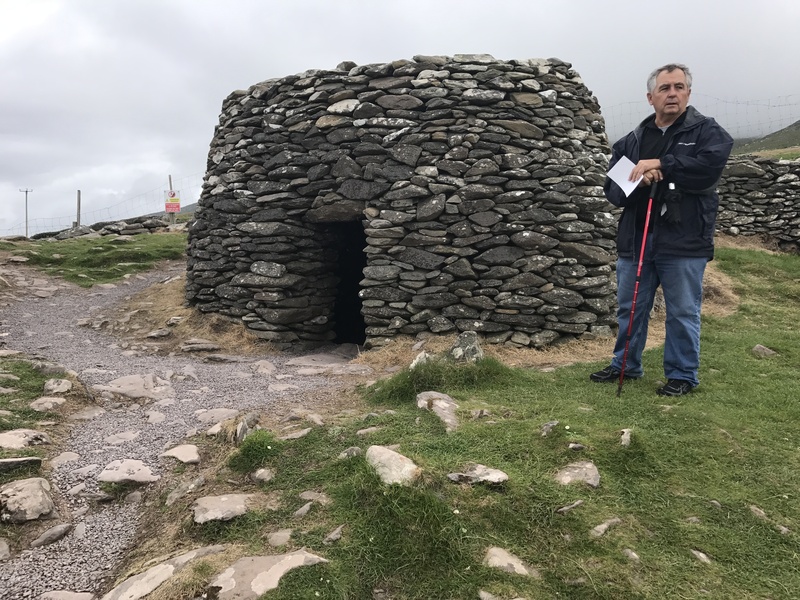 We then traveled a few miles to Knocknarea, a large hill topped with the largest cairn in Ireland for our first Sligo hike. The view from the top of Knocknarea, situated between the bays of Sligo and Ballysadare was stunning, and we could see why the area has inspired poets for centuries..
We ended our beautiful day with golf at Rosses Point, a course Tom Coyne raved about in A Course Called Ireland. It was easy to spot the locals on the course; they wore far fewer layers than we did. 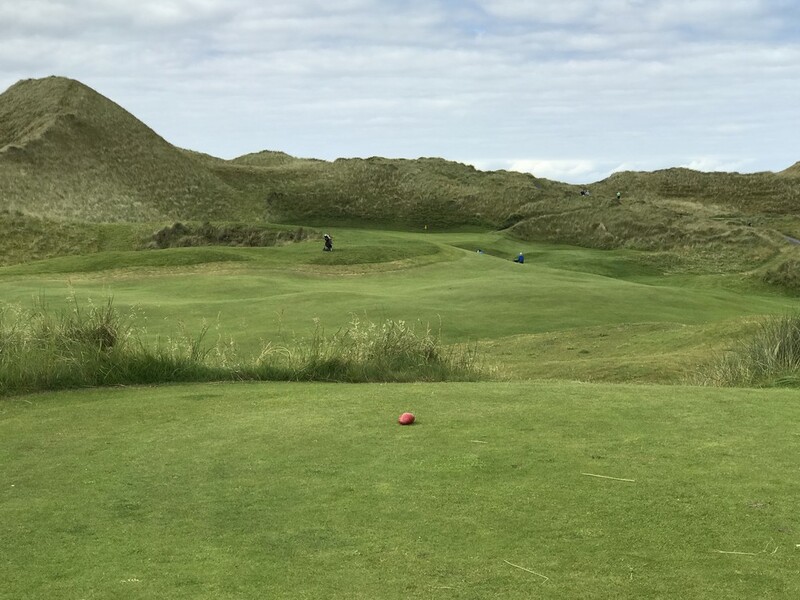 Established in 1894, Rosses Point is a links course which means it is situated on an area of coastal sand dunes on undulating surfaces unsuited for farming. The views were amazing. 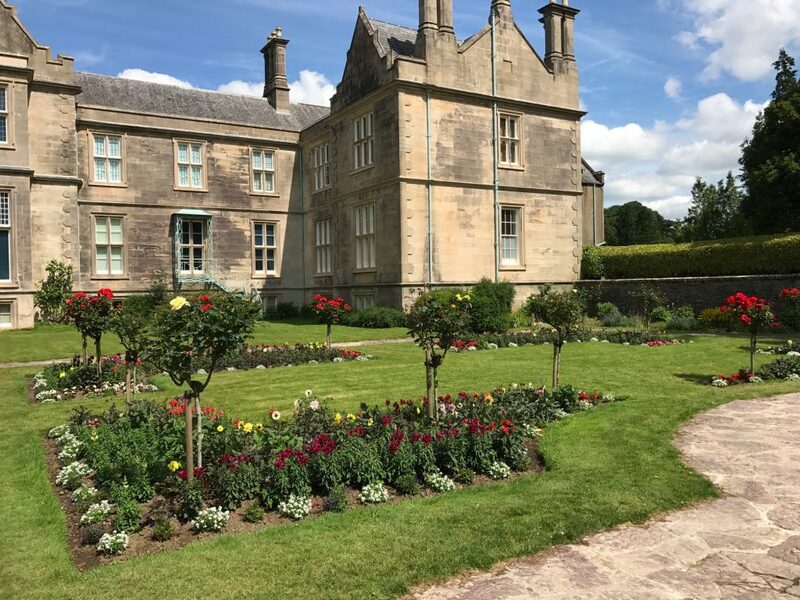 This entry was posted in Ireland 2017 on July 6, 2017 by debbie. Irish poet William Butler Yeats perfectly described the charm of the Irish people in his famous quote. 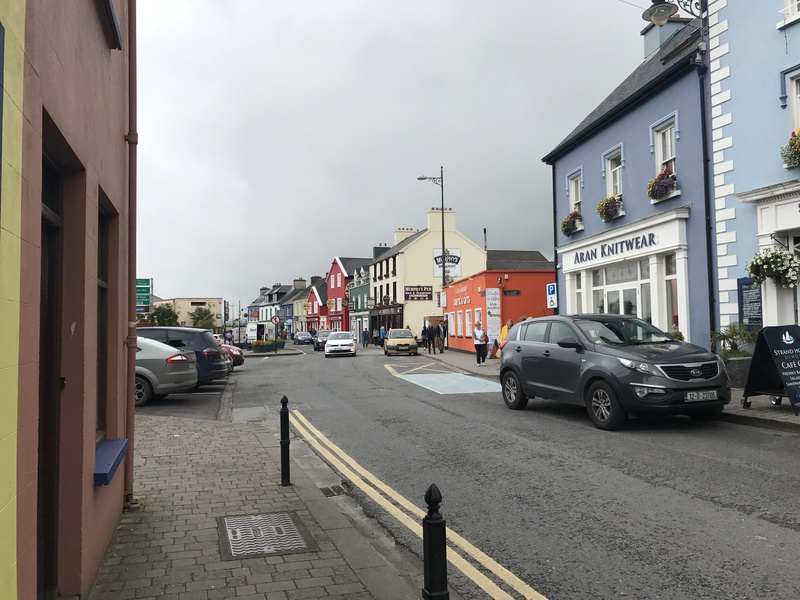 After my last trip to Ireland, I knew I would come back to this beautiful country and its friendly people. And now I am. 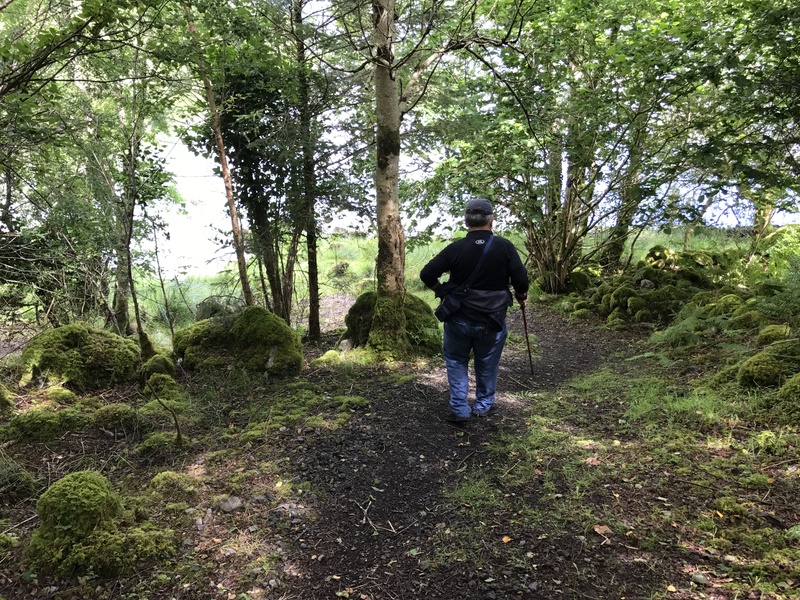 Unlike our previous visits to Dublin and Galway, my husband and I are visiting Western Ireland to golf, hike and explore some of its smaller towns. 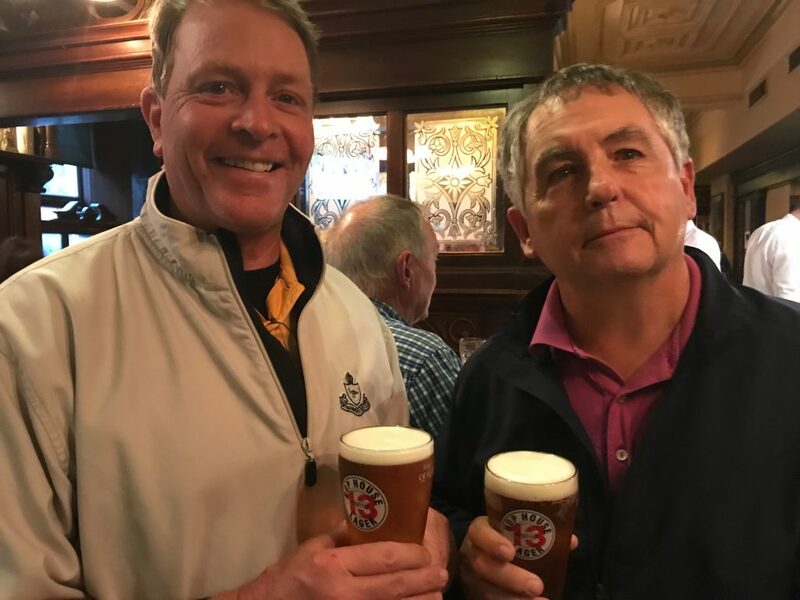 A Course Called Ireland: A Long Walk in Search of a Country, a Pint, and the Next Tee in which Tom Coyne shares stories of his sixteen weeks spent walking and golfing the perimeter of Ireland inspired this trip. 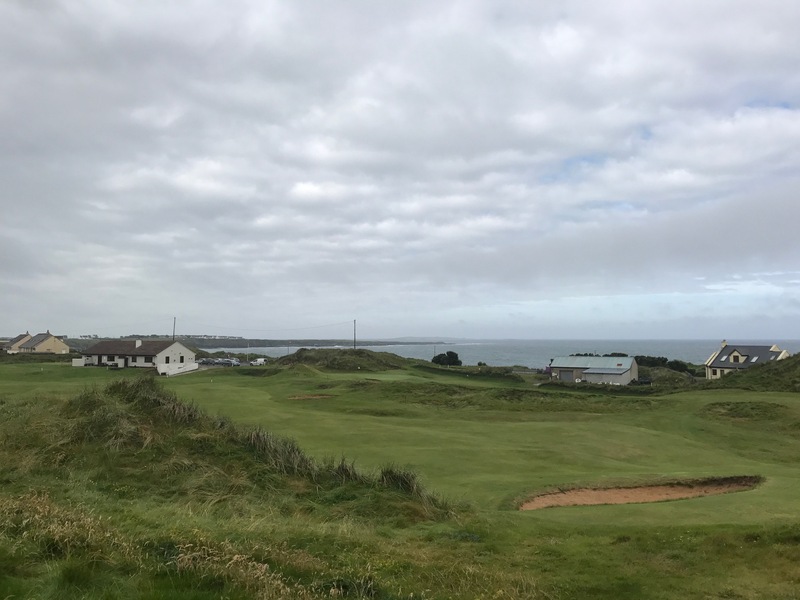 Coyne’s recommendations for golf courses, hikes, and traditional Irish music pubs formed the backbone of our itinerary. 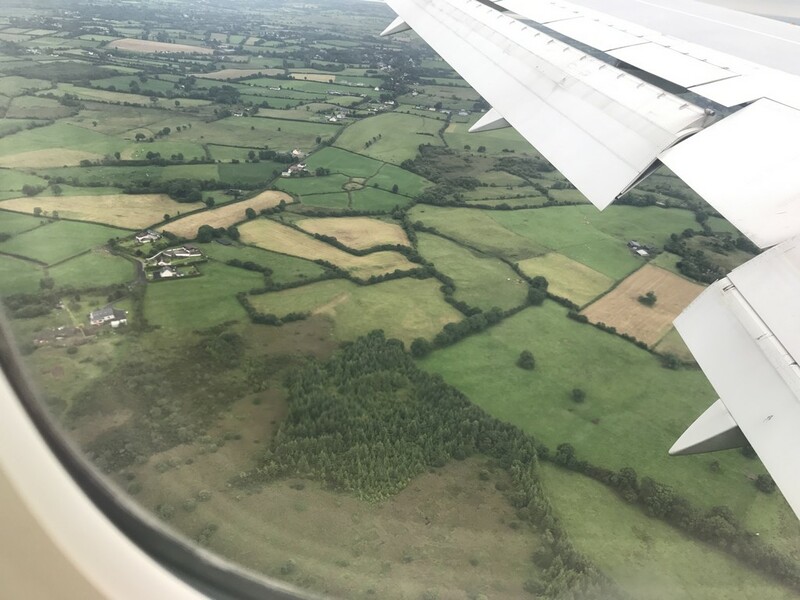 Looking out the window as our plane approached the Shannon airport, we remembered the beauty of the vibrant green countryside. 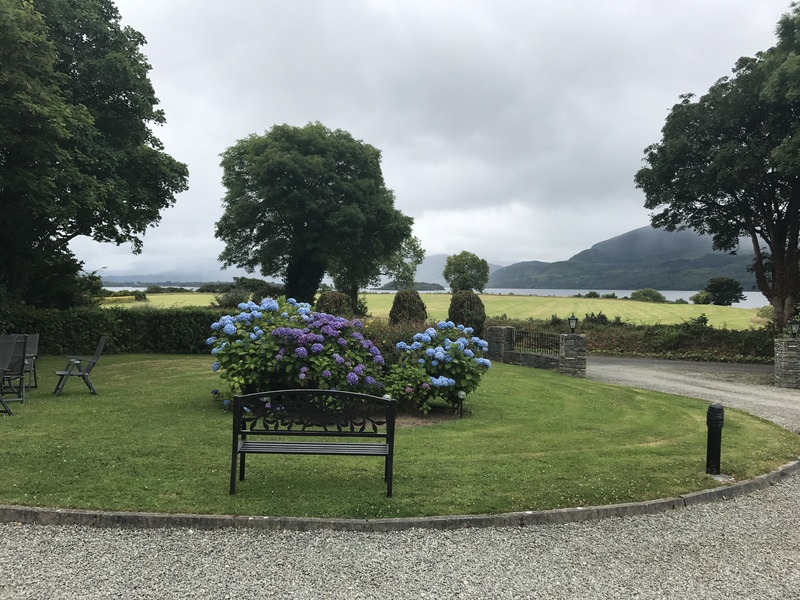 After picking up our rental car we drove to Sligo, two and half hours north of Shannon. Google maps made a serendipitous change to our route and suddenly we were directed from the main highway to a narrow road barely wide enough for two cars to pass. 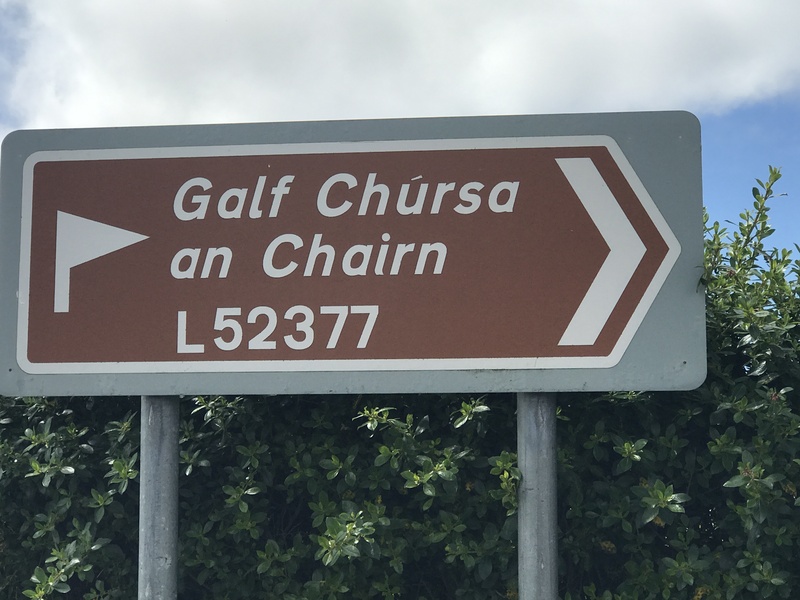 Not sure why we were directed to such a tiny country road, we kept heading north and saw lovely wee sites we would have missed on the main road. 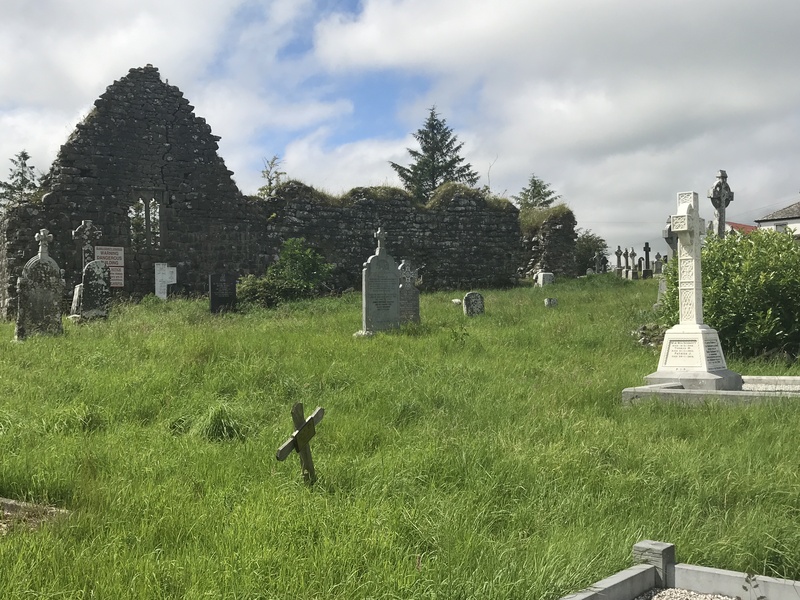 One was a tiny cemetery with a crumbling stone church in the middle. Eventually we got back on the main road and arrived at our first stop, Pearse Lodge B&B in Sligo. 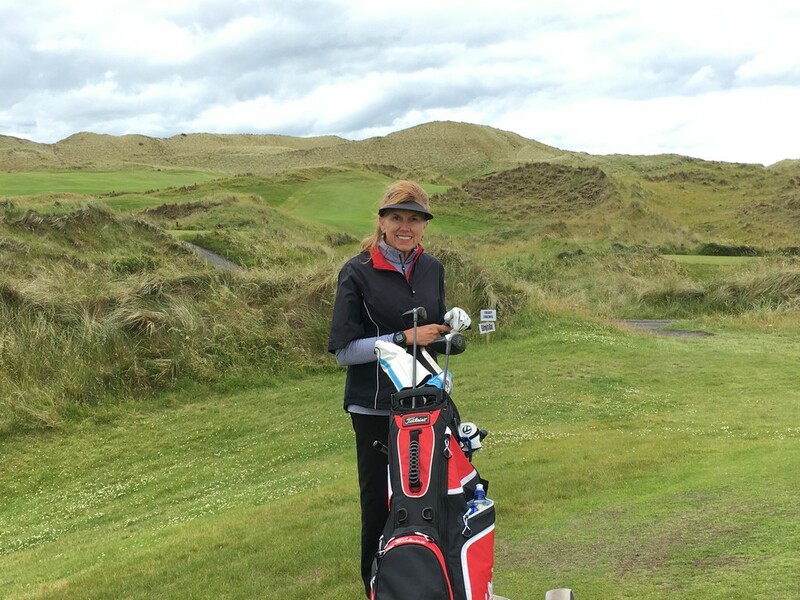 My memories of Ireland include beautiful scenery, friendly people, traditional music and great golf. They don’t include great food. But I think that will change on this trip. 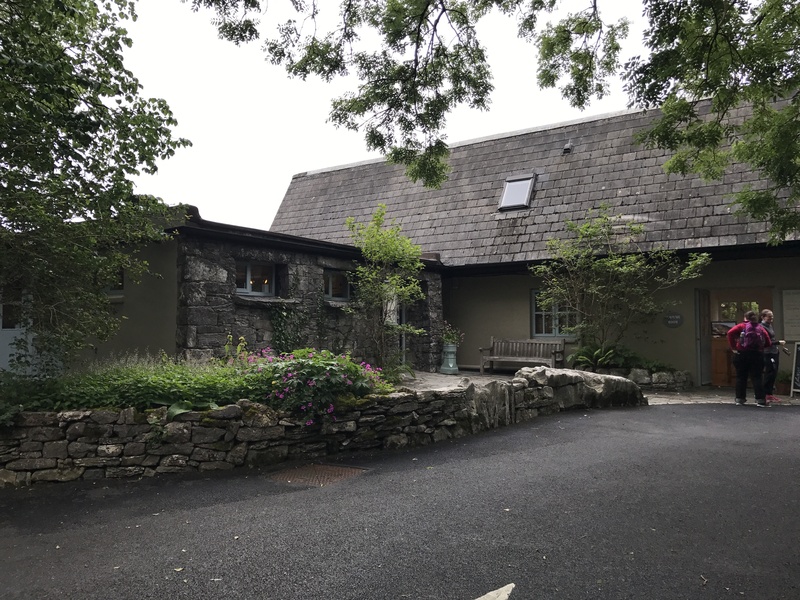 Pearse Lodge owner Mary Kearney told of us Ireland’s dedication to producing high-quality food and its growing food trails. 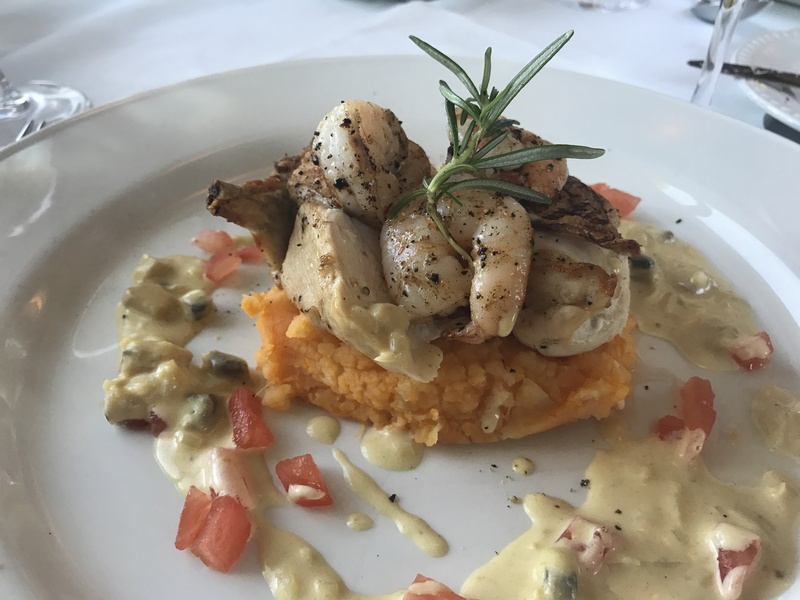 For example all beef in Ireland is grass fed, and all of the seafood in Sligo is local. As she was recommending Sligo restaurants and telling us what made them so good, I started worrying that I wouldn’t have enough days to try them all. She also told us that some of the Irish food we eat in the US, such as corned beef and cabbage, isn’t eaten in Ireland. 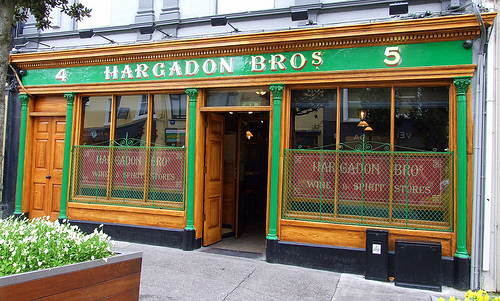 Tonight I started my Irish culinary adventure with an amazing meal at Hargadon Bros. restaurant. 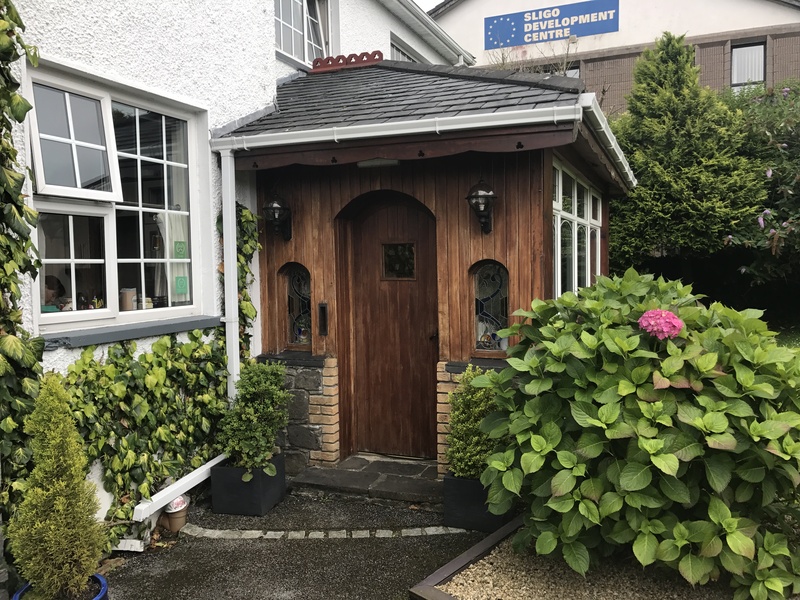 Recommended by our B&B hostess for its dedication to locally sourced and produced food set in an authentic pub setting dating from 1864, this quaint restaurant surpassed our expectations. 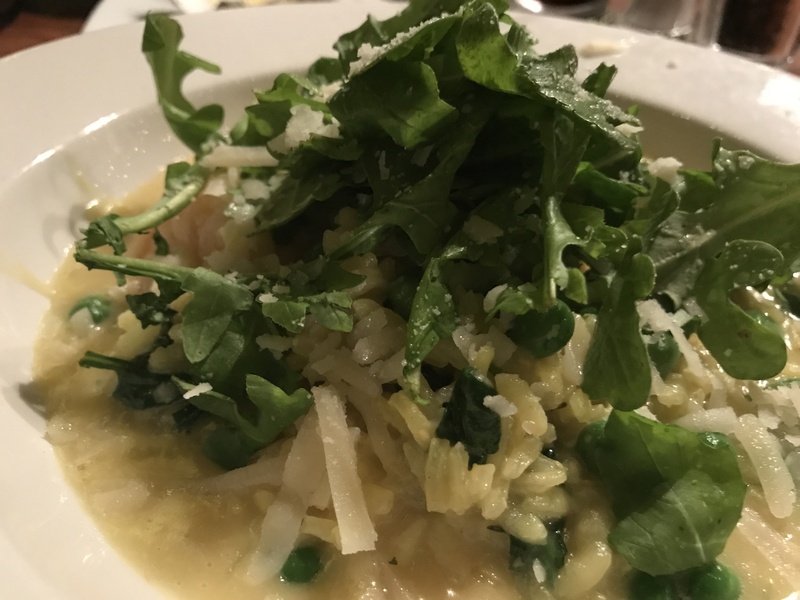 Paul had the best moules and frites ever, and I had a yummy shrimp saffron risotto. The homemade brown bread was an extra treat. 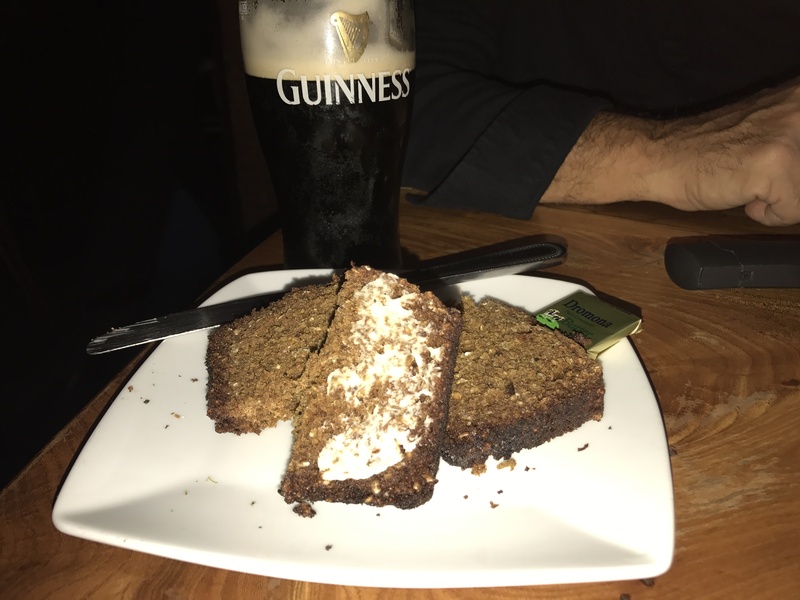 And, of course, it all went great with Guinness. 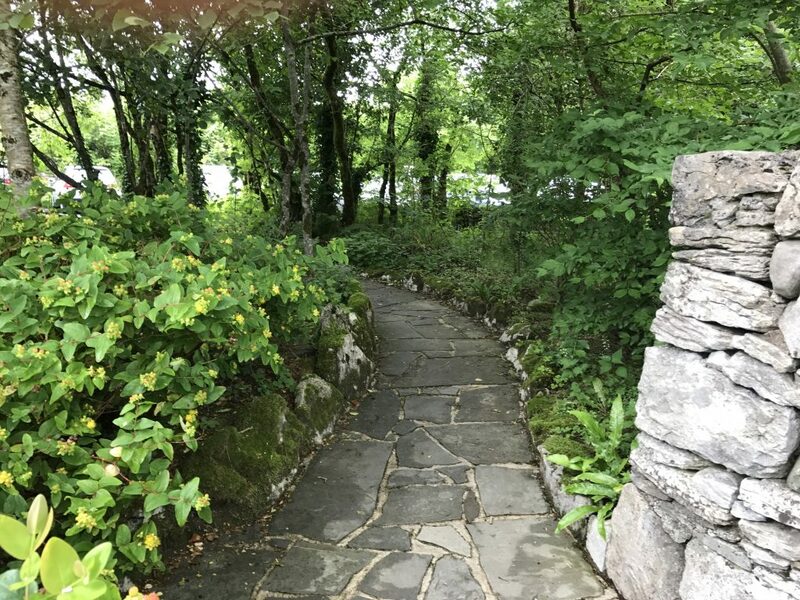 This entry was posted in Ireland 2017 on July 4, 2017 by debbie.